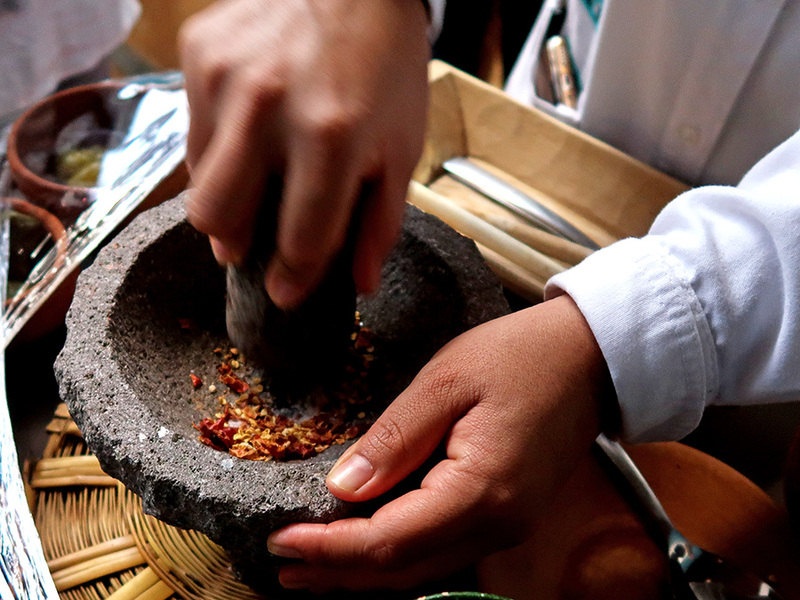 Yesterday, Mexico celebrated el Día del Artesano (Day of the Artisan). 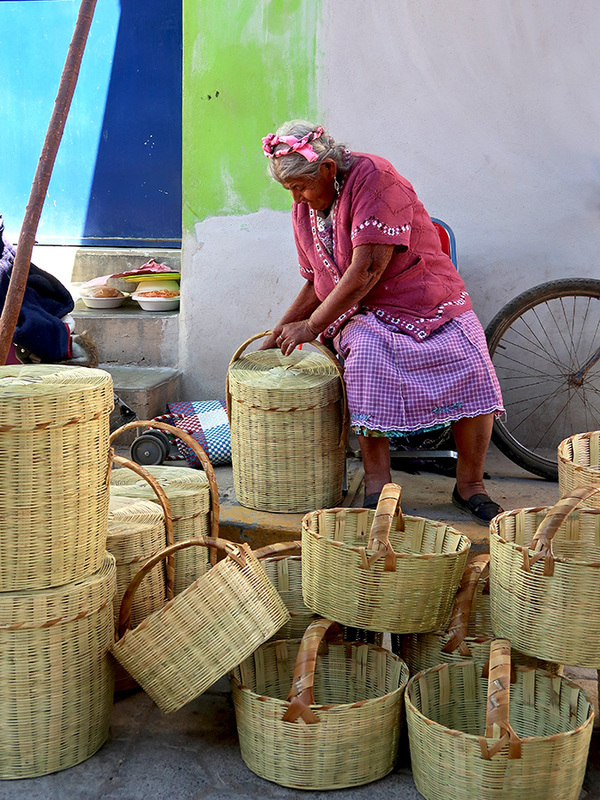 Alas, I’m a day late in recognizing the men and women whose artistry in carrying on traditions and renewing and enriching them with their own creative spirit contributes to Oaxaca’s vibrant cultural life and economy. 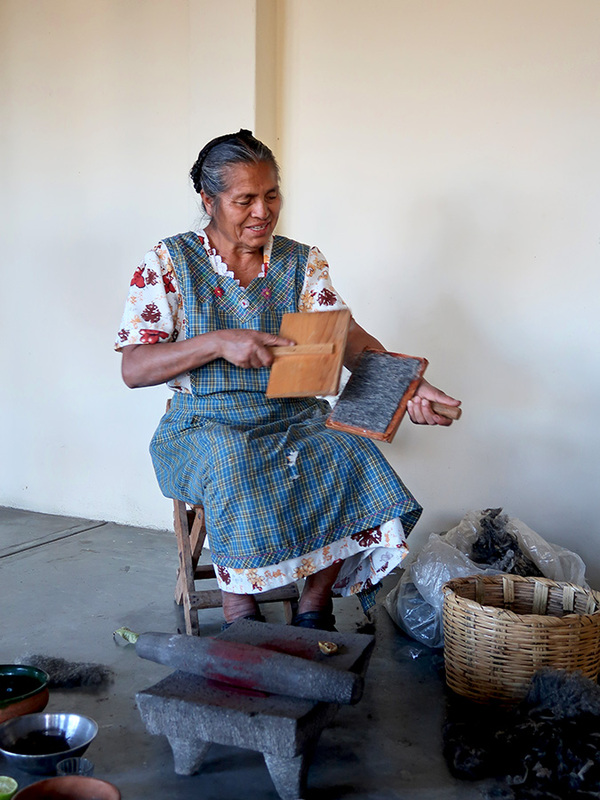 However, the entire month of March has been designated “month of the artisan,” so here are several of the artesanas and artesanos who I have had the honor and joy of knowing and visiting over the past year. 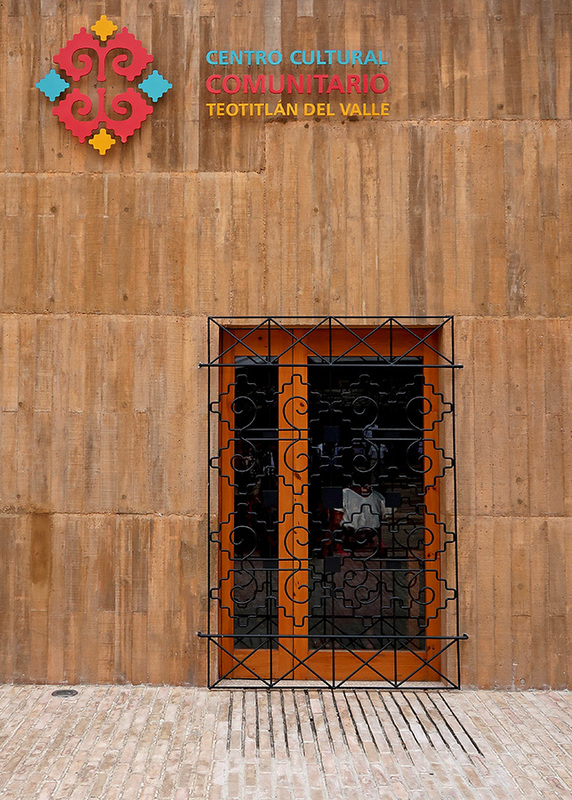 A very special thank you to Don Luís, whose weaving studio shares a wall with my apartment and I have the pleasure of seeing and hearing most every day. 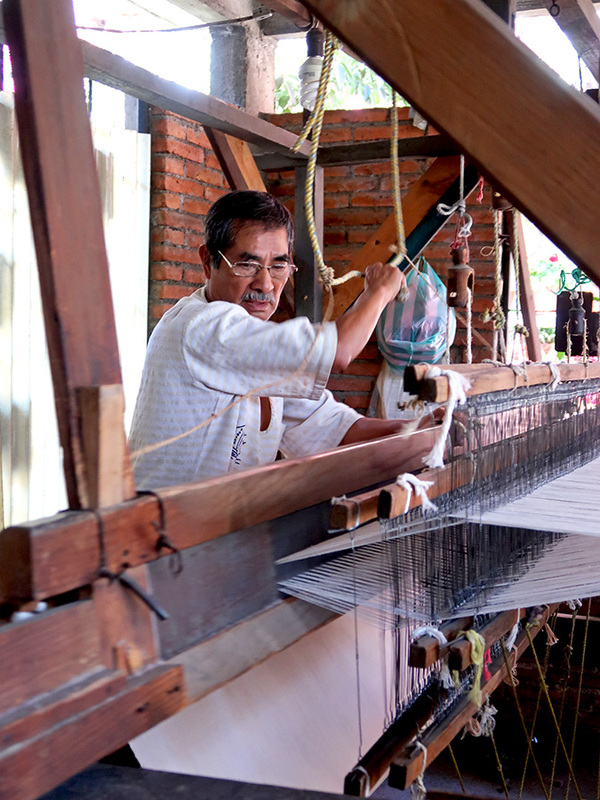 The rhythmic sounds of his loom are one of the songs on the soundtrack of my Oaxaca life. 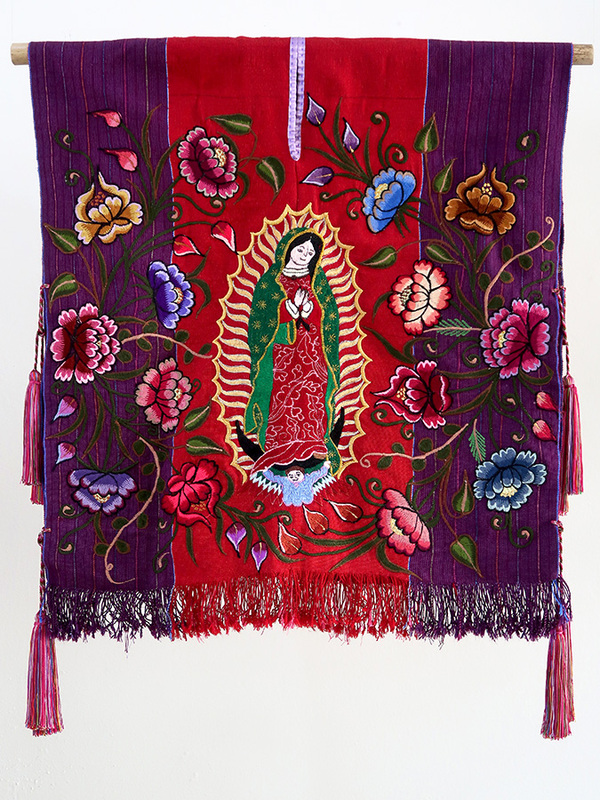 The devotion to the Virgin of Guadalupe captured the imagination of fiber artist Linda Hanna when, as an early teen, she visited Mexico with her family and saw believers crawling on their knees up to the Basilica of Our Lady of Guadalupe. 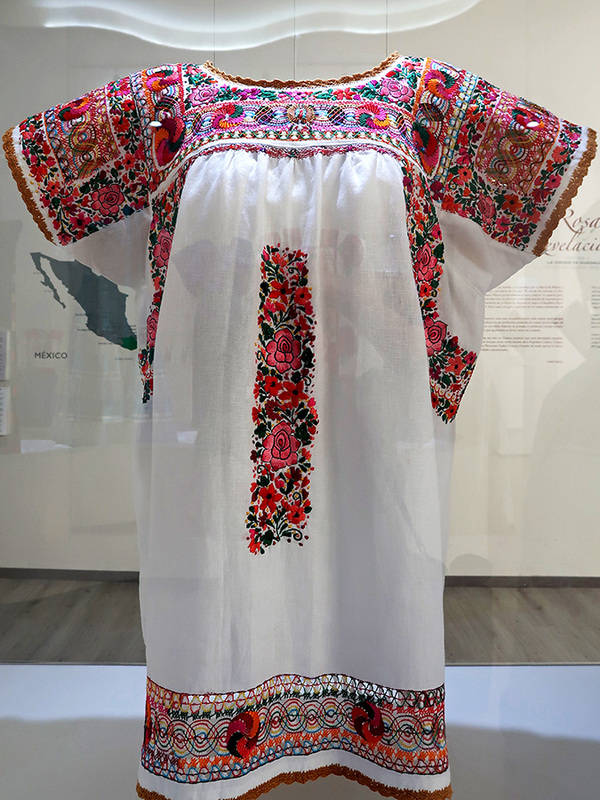 Blouse by Teresa Silvia Tzintzun, San Pedro Zipiajo, Michoacán (Purepecha). 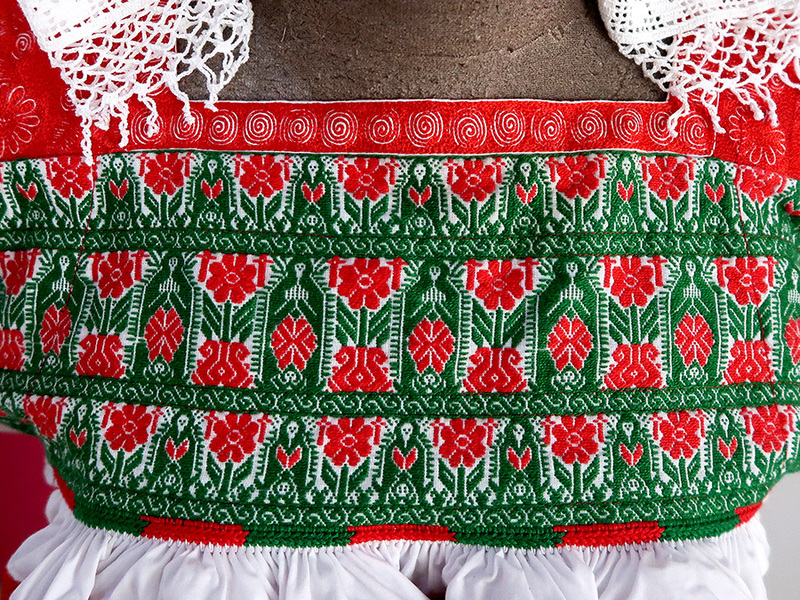 Detail of blouse by Teresa Silvia Tzintzun, San Pedro Zipiajo, Michoacán (Purepecha). 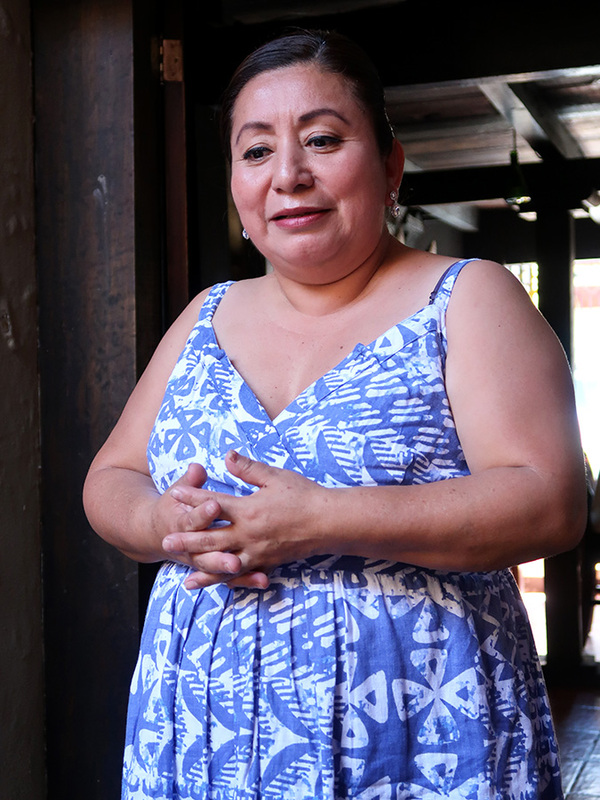 The Virgin’s appeal continued to deepen when Linda moved to Oaxaca in 1997. 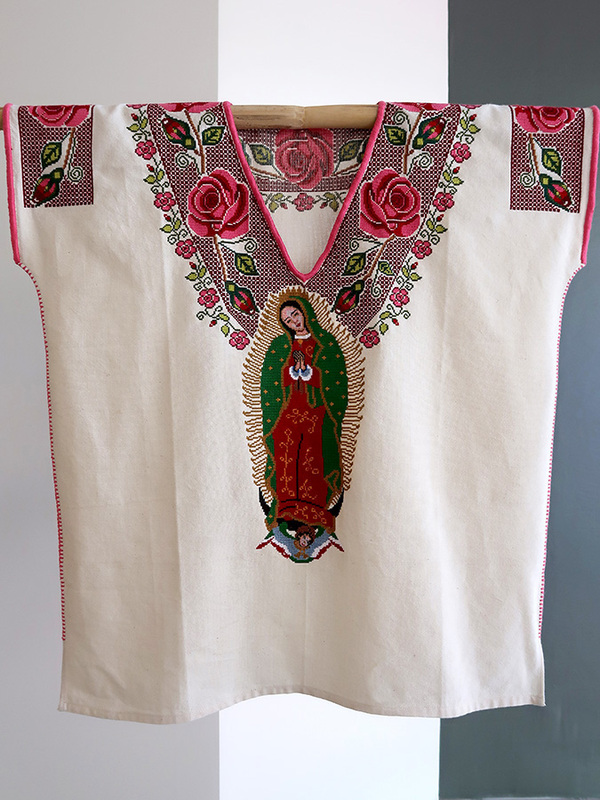 Thus the seeds/threads of the exhibition, “Rosas y Revelaciones: Homage to the Virgin of Guadalupe by Mexican Textile Artists” were sown/sewn. 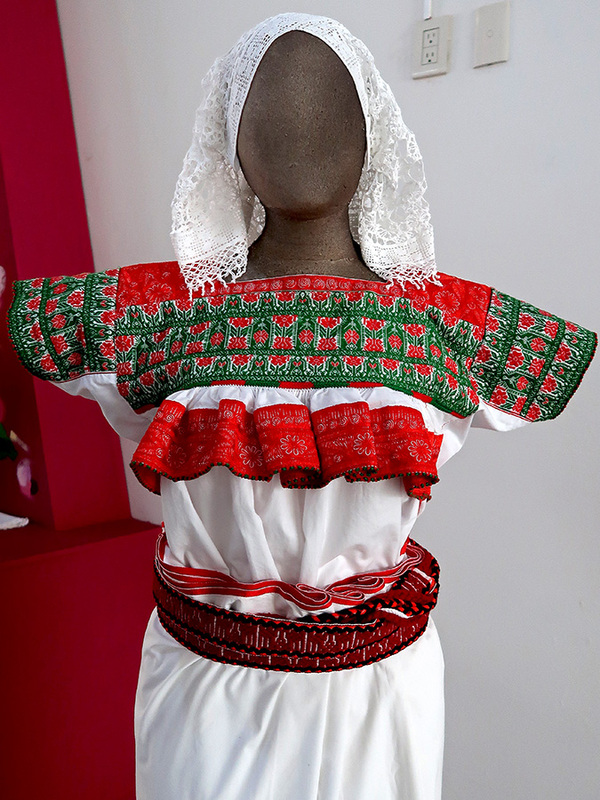 Blouse by Marcolina Salvador Hidalgo, Chachahuantla, Puebla (Nahua). 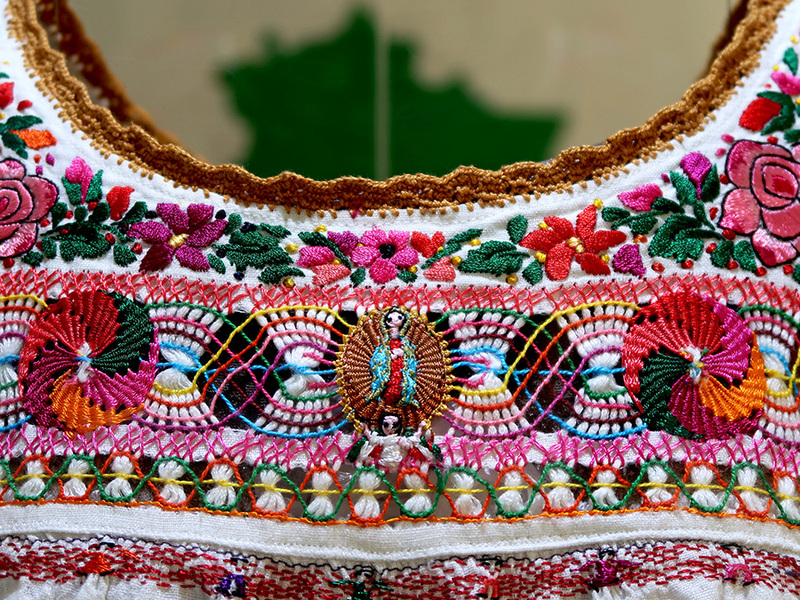 Detail of blouse by Marcolina Salvador Hidalgo, Chachahuantla, Puebla (Nahua). 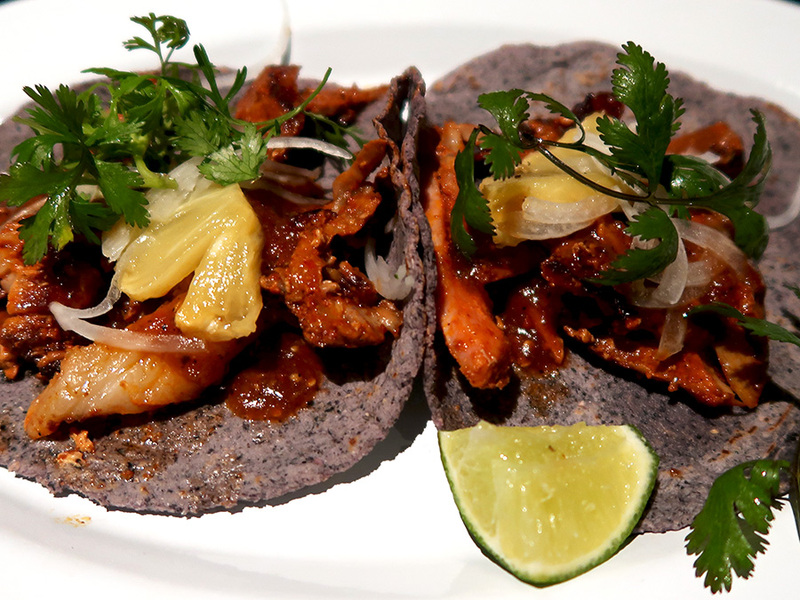 The legend of La Virgen de Guadalupe is known to every Mexican, every person of Mexican descent, and probably every foreigner who calls Mexico home. 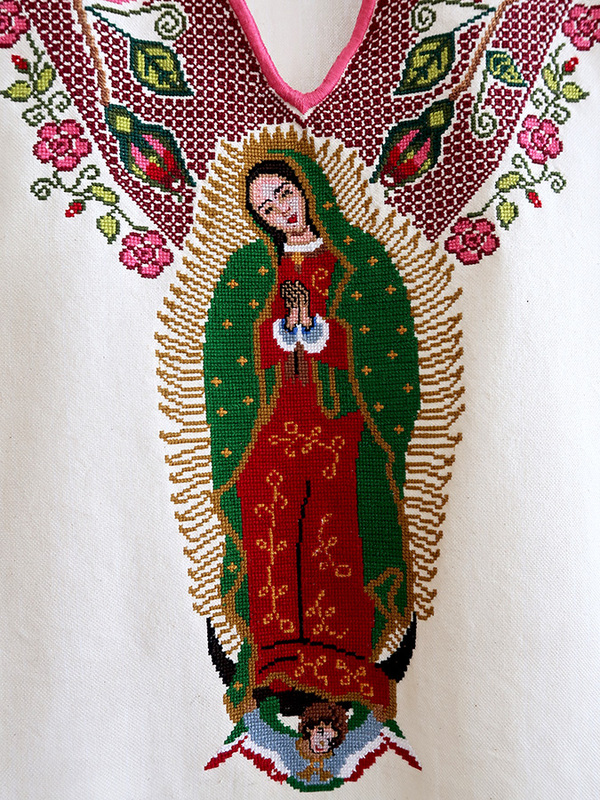 The image of this dark-skinned Virgin who spoke Náhuatl is as imprinted on the national consciousness as she was on Juan Diego’s legendary tilma (cloak). 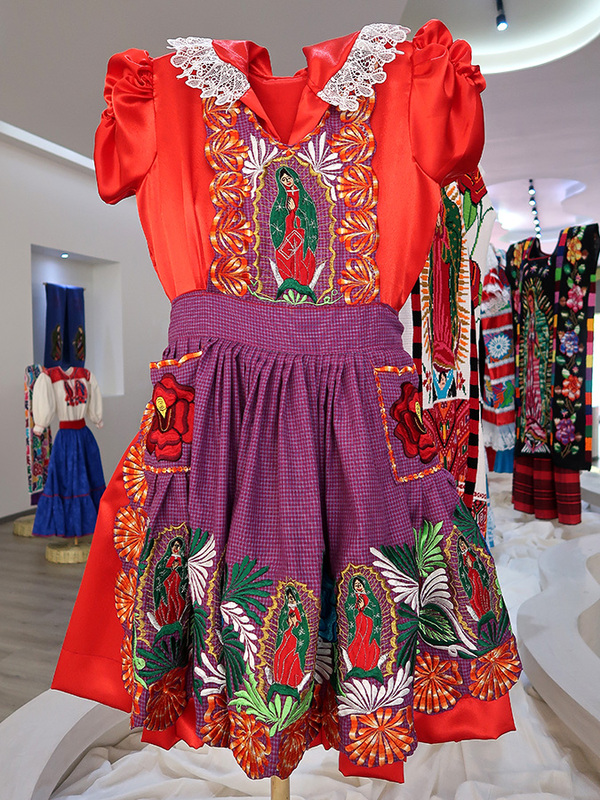 Dress by María Guadalupe Santiago Sánchez, San Antonino Castillo Velazco, Oaxaca (Zapoteco). Detail of dress by María Guadalupe Santiago Sánchez, San Antonino Castillo Velazco, Oaxaca (Zapoteco). Her image has continued to appear on cloth, albeit with human, not divine, intervention. 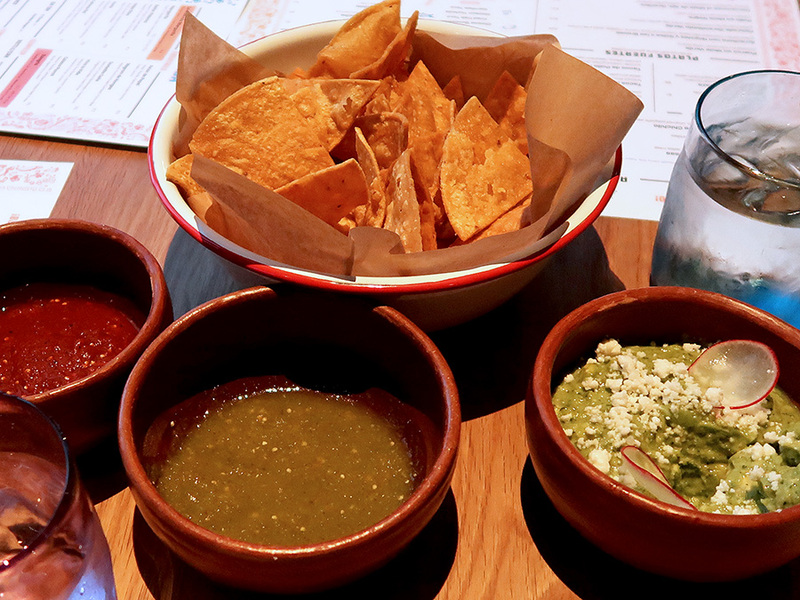 Both Father Miguel Hidalgo in the Mexican War of Independence and Emiliano Zapata, one hundred years later, during the Mexican Revolution, led their troops under the banner of Our Lady of Guadalupe. Man’s tunic by Pascuala Vásquez Hernández, Zinacatán, Chiapas (Tzotzil, Maya). 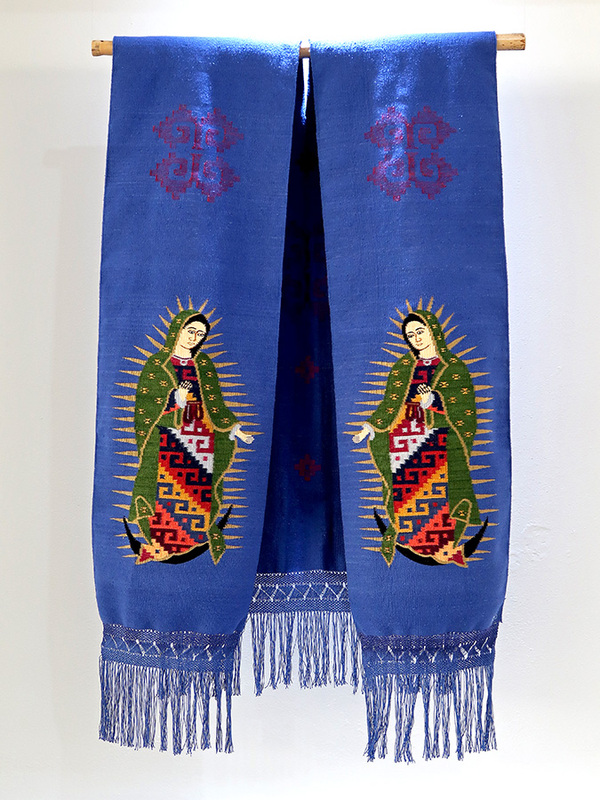 Shawl by Adolfo García Díaz & Delvina Salinas Cruz, Tenancingo, Estado de México. 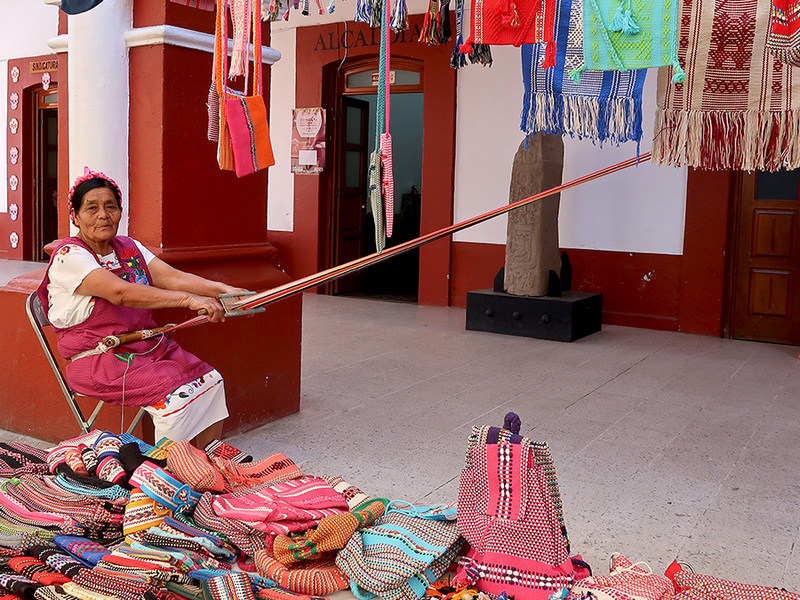 The Rosas y Revelaciones textile exhibition presents work from 52 communities in ten states in Mexico (Chiapas, Colima, Guerrero, Jalisco, Mexico, Michoacán, Oaxaca, Puebla, Tlaxacala, and Yucatán) — with the majority being from Oaxaca. 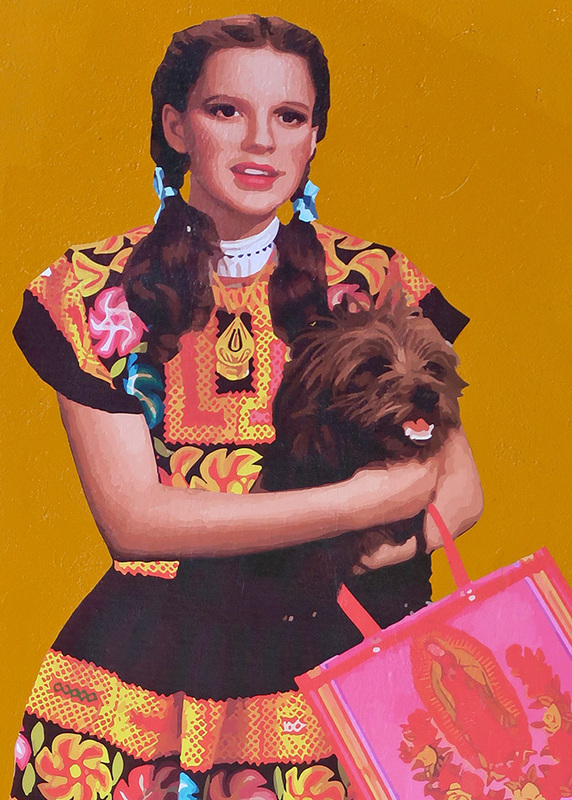 Apron by Valeria García Hernández, San Miguel del Valle, Oaxaca (Zapoteco). 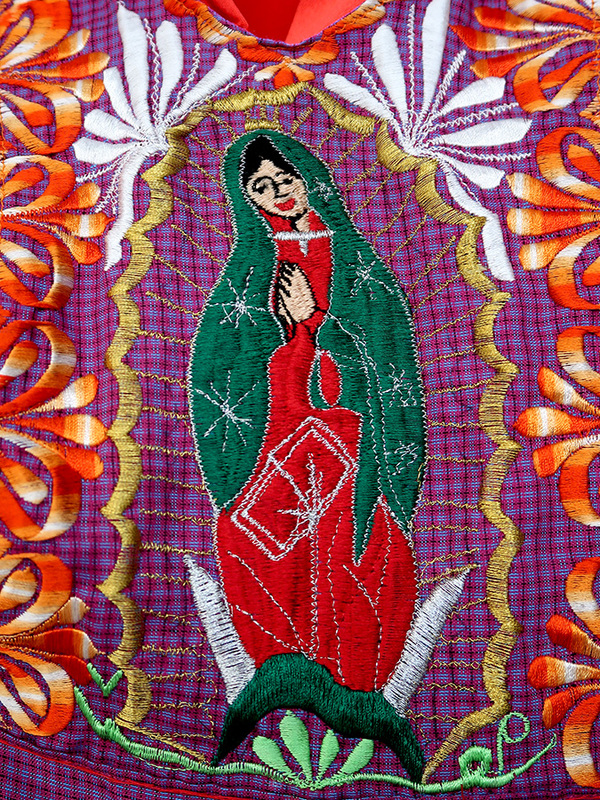 Detail of apron by Valeria García Hernández, San Miguel del Valle, Oaxaca (Zapoteco). pull the image from me, the beauty. Ruana by Erasto (Tito) Mendoza Ruiz, Teotitlán del Valle, Oaxaca (Zapoteco). 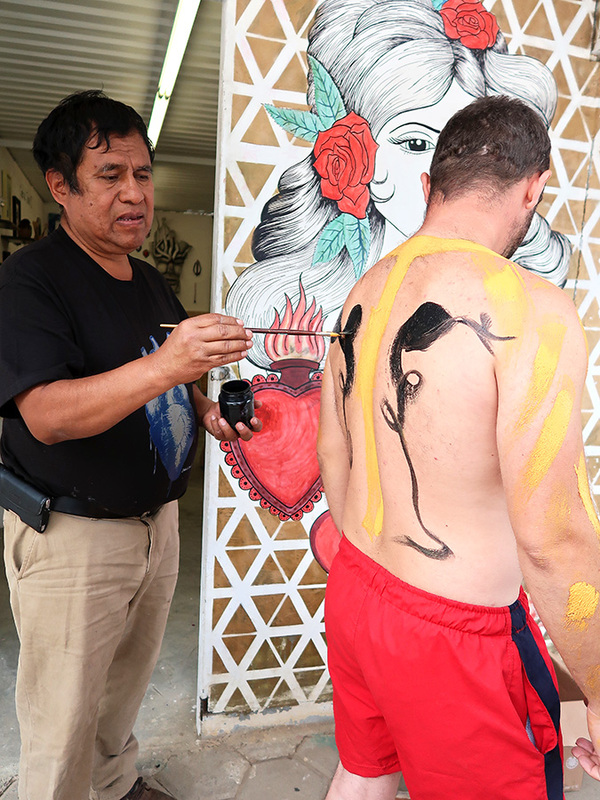 When you go, be sure to take the time to watch the video interviews with some of the artisans — the seriousness, devotion, and honor they felt at being selected to participate in this incredibly special project is extremely moving. 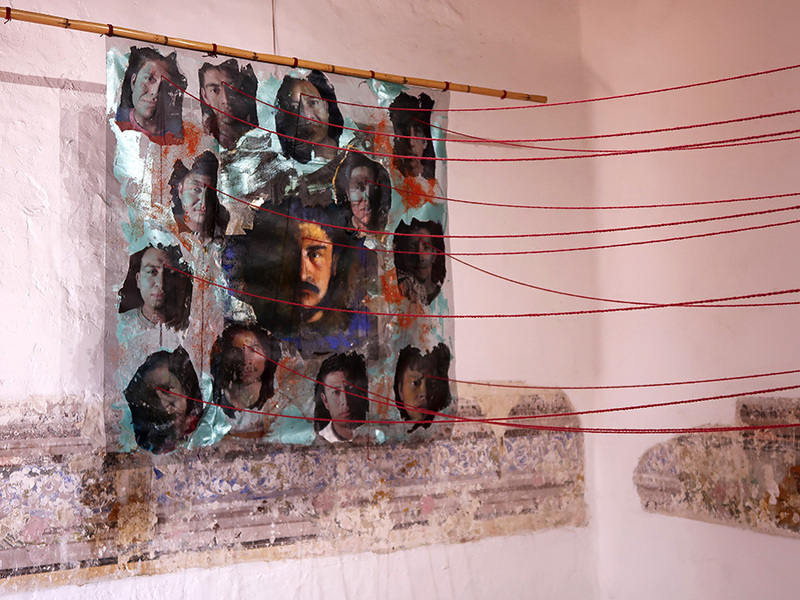 The show is currently at the Museo Estatal de Arte Popular Oaxaca (MEAPO) (closed on Mondays) in San Bartolo Coyotepec, Oaxaca and runs through March 17, 2019 (extended until April 28, 2019) — after which it will be prepared to tour. 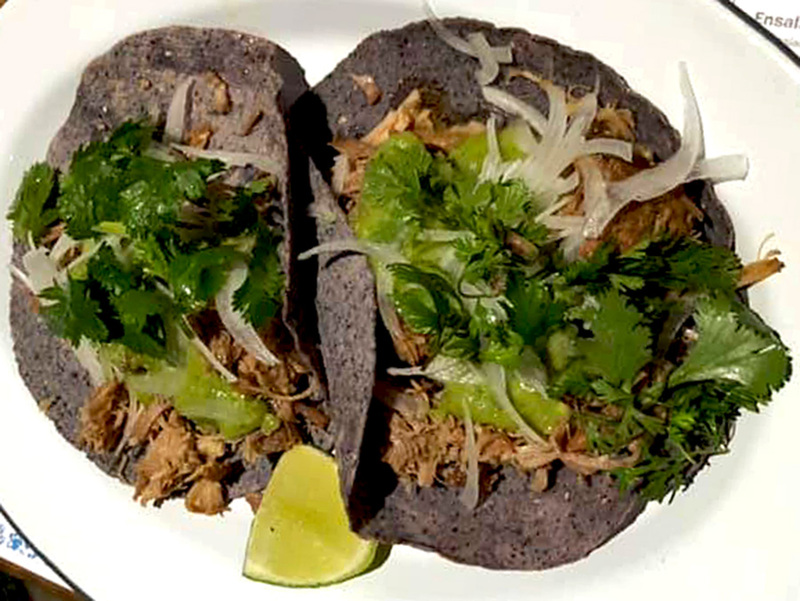 Its first stop will be at the Museo Nacional de Culturas Populares in Coyocán, Mexico City — in time for Día de la Virgen de Guadalupe on December 12, 2019. 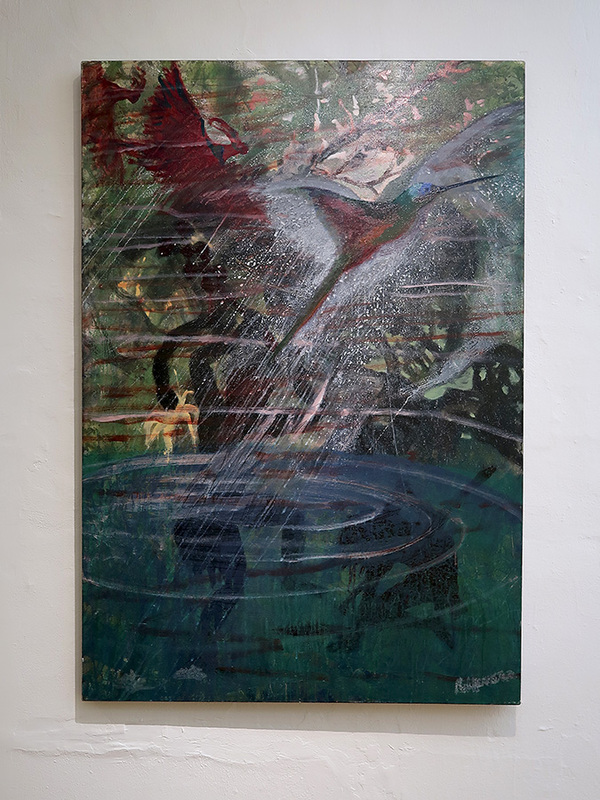 (ps) Linda is hoping the exhibition will develop wings and fly throughout Mexico and eventually to the USA. If you have contacts in the museum world who might be interested in hosting this exhibition, please be sure to contact Linda. 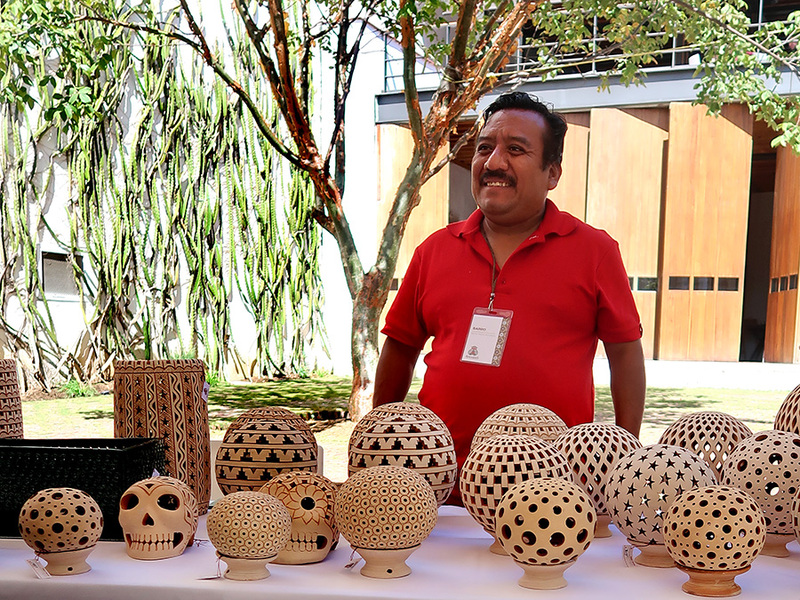 On November 30, I went to the opening of the Bajo la bóveda azul cobalto/Under the Cobalt Blue Sky exhibition at the Museo de Arte Contemporáneo de Oaxaca (MACO) — an innovative collaboration that paired thirteen visual artists from the USA and France with thirteen local artisan families. 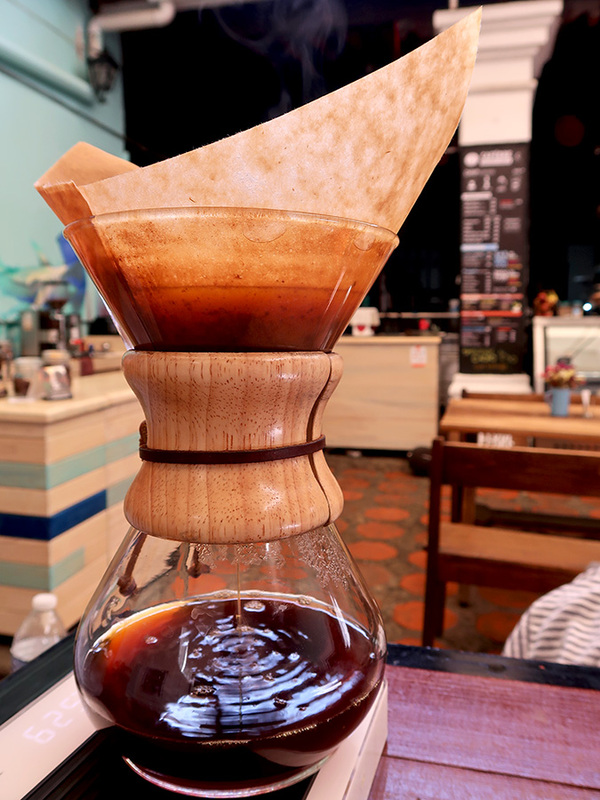 It was a fabulous and jam-packed event infused with the energy of conversation and creativity. Unfortunately, with so many people in attendance, seeing the art was challenging and I vowed to return. 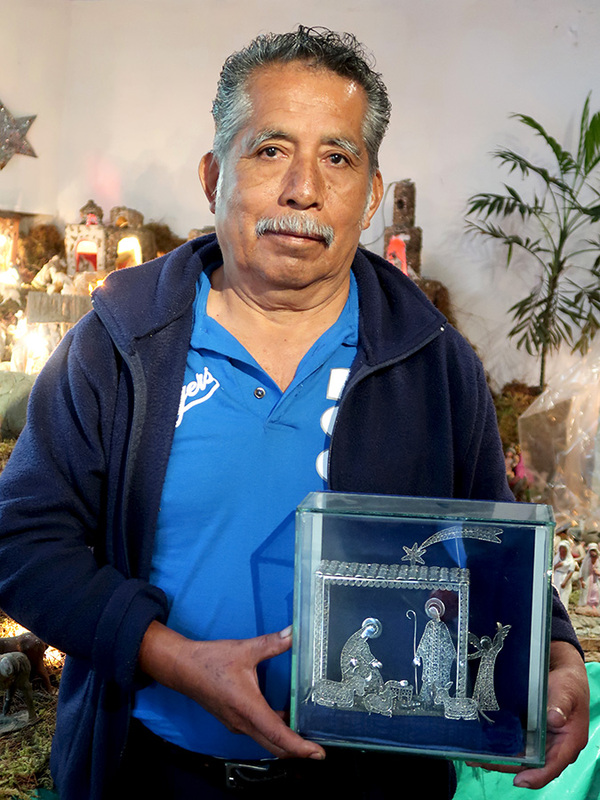 Running into weaver Antonio Lazo Hernández, brother-in-law of Porfirio Gutiérrez Contreras, when I was in Teotitlán del Valle for the first day of the Virgen de Guadalupe festivities, gave me the nudge I needed to make time to actually see the show before leaving for my el norte trip. 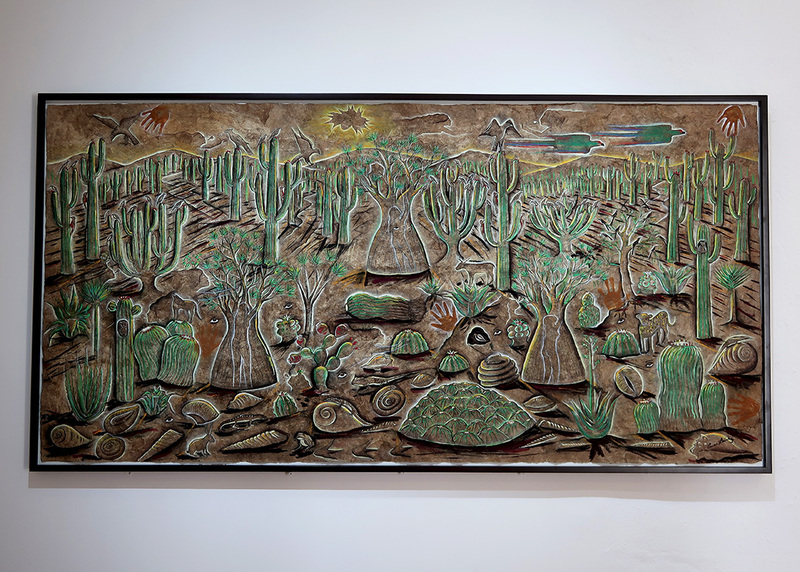 At the opening, I hadn’t even realized that Porfirio and his family (Antonio, Juana Gutiérrez Contreras, and Javier Lazo Gutiérrez) had been paired with Peter Liashkov to create a piece for the exhibition. 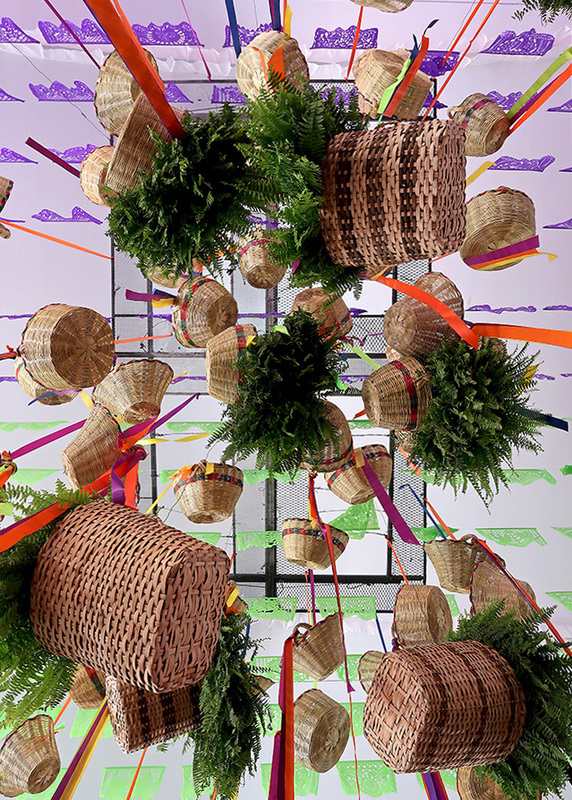 Their collaboration explored the story of the Danza de la Pluma — linking images of the Danza de la Pluma Promesa 2016-2018 danzantes to symbols used in the dance. They even incorporated the well-worn sandals of the dancers. 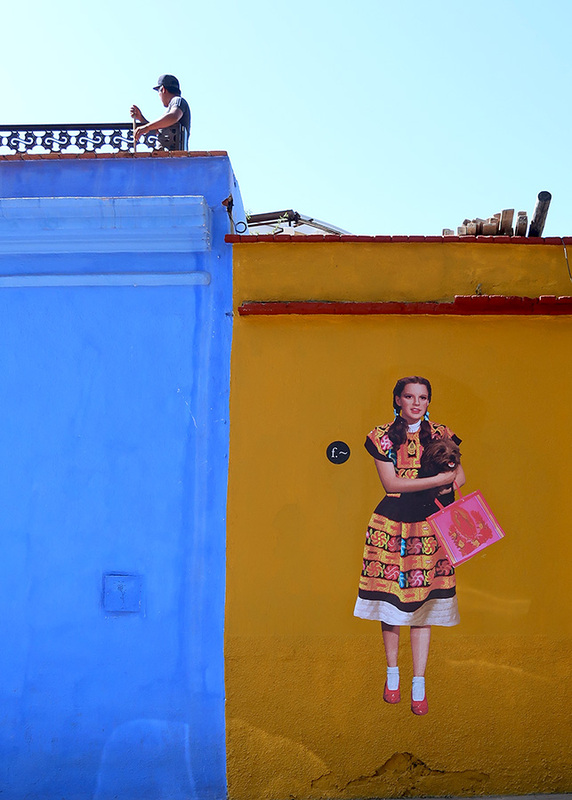 Bajo la bóveda azul cobalto/Under the Cobalt Blue Sky runs through the end of February. 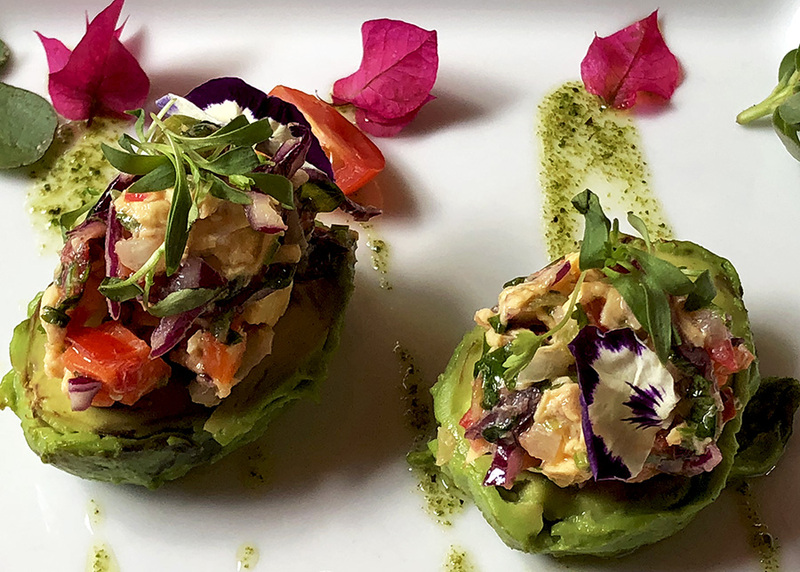 There are twelve other amazing collaborations that demonstrate “what can happen when we accept our differences and our similarities; it is an example of coexistence under the same blanket of stars.” If you are in town, it is a show not to be missed. 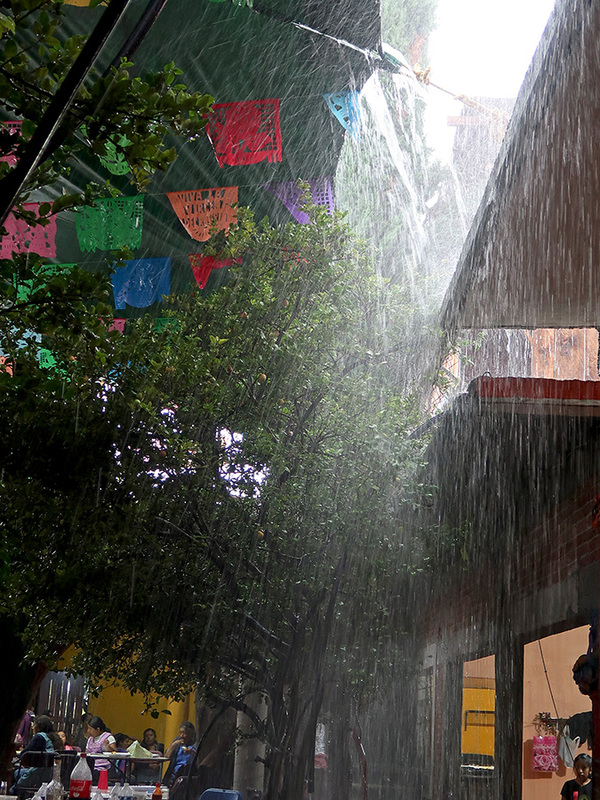 Monday afternoon, in the middle of a fiesta at the home of Danza de la Pluma danzante Juan Pablo González Gutiérrez, a torrential downpour came to Teotitlán del Valle. As I’ve mentioned, rain has been scarce this rainy season — a serious situation for a community that relies on subsistence farming. 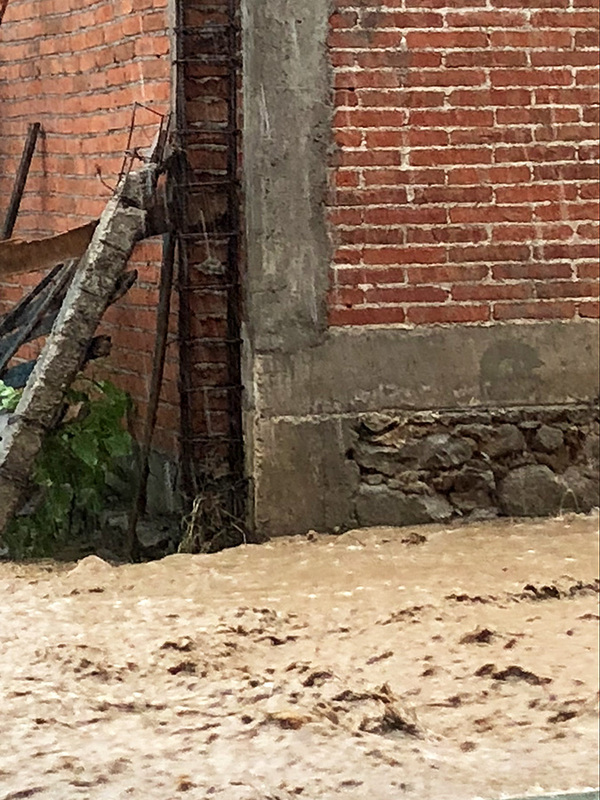 So, despite the fact that the dirt road in front of the house became a muddy rushing river and festivities had to be put on hold for awhile as rain blew in through openings in the tented patio, this deluge was good news and people were smiling. 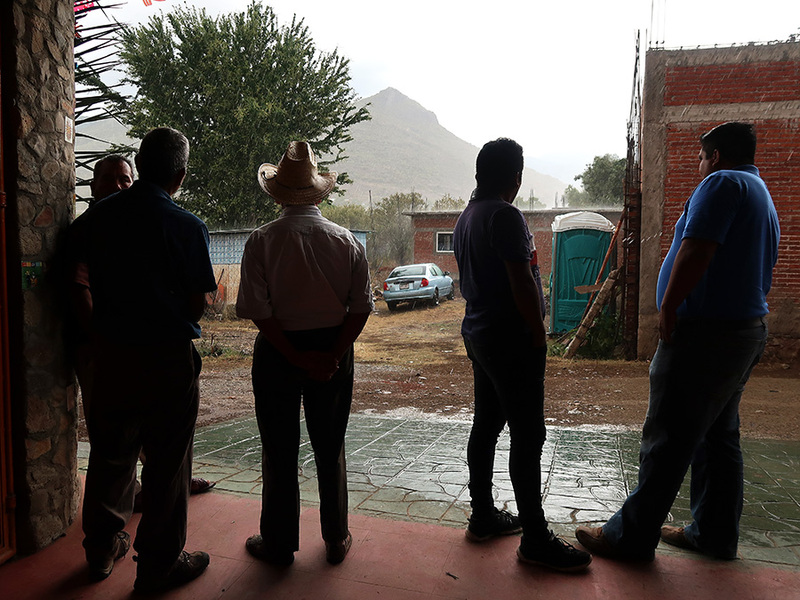 Everyone, including Juan Pablo, waited patiently for the life-giving rain to let up. It eventually did and he was able to dance. 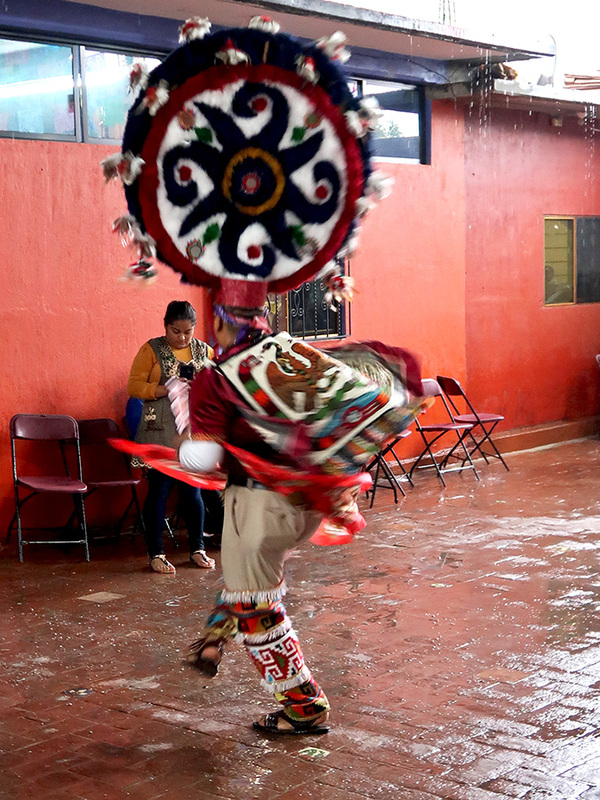 On a wet patio, surrounded by 100+ proud family members, fellow danzantes, and guests, he performed his solo dance. Blogger buddy Chris and I felt so incredibly honored to have been invited. It was a truly memorable experience that we will treasure always. 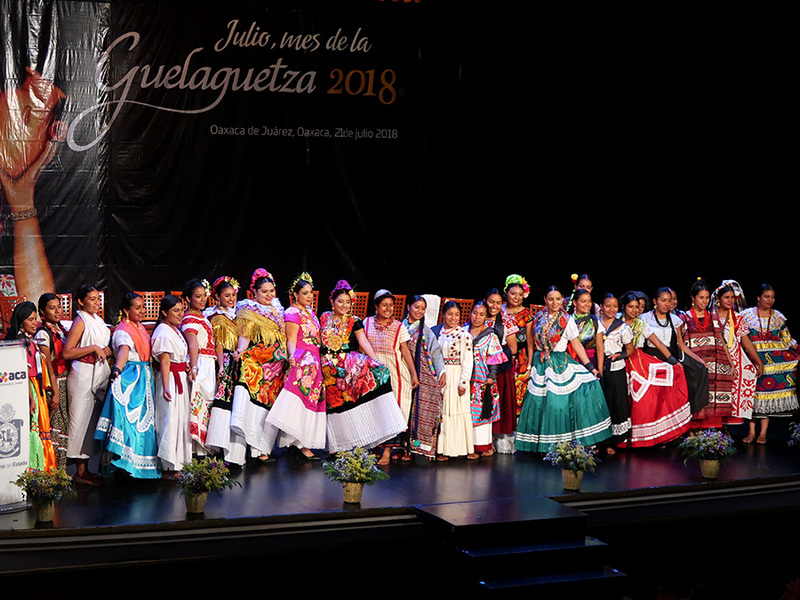 Muchisimas gracias to Juan and his family and all the members of the Danza de la Pluma Promesa 2016-18 for being so warm and welcoming to us over the past couple of years. We are going to miss you! I have returned to my hometown for my 50th high school reunion. 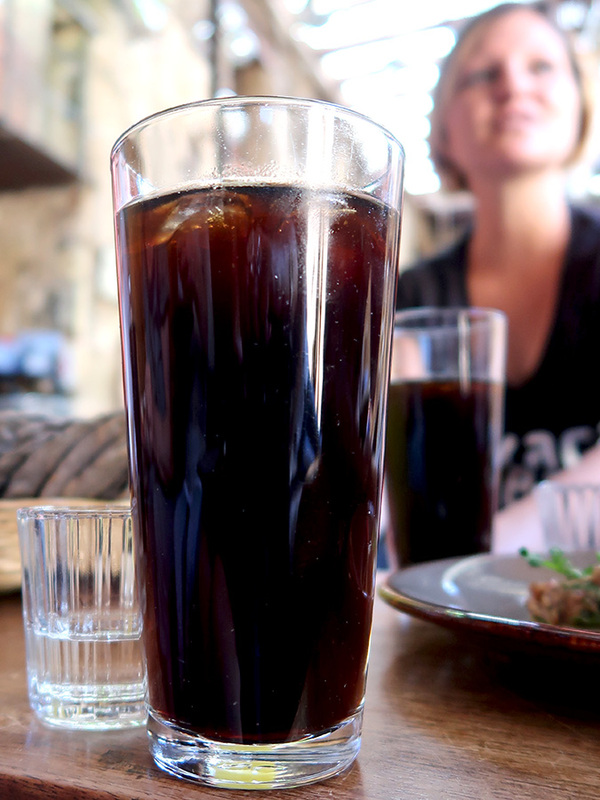 (How could I possibly be that old?!) 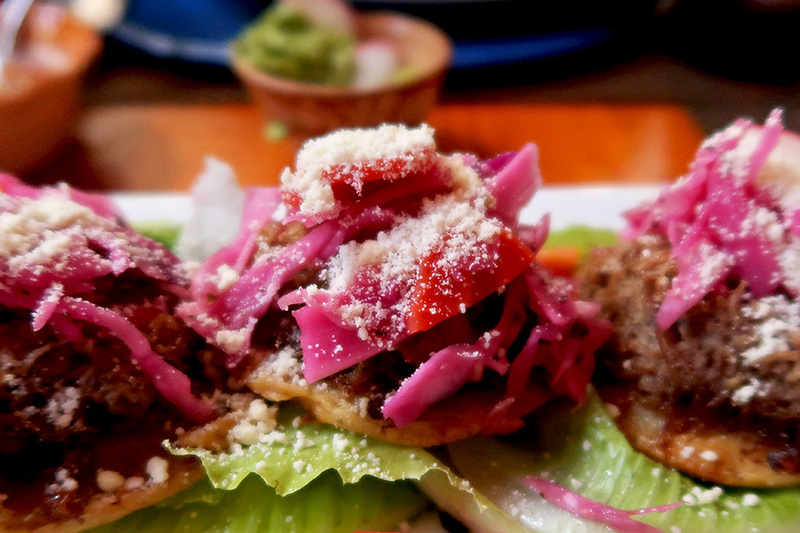 Whenever I come up to the USA, I make a point of bringing a little Oaxaca love with me. So, this trip I brought my three newest textile treasures to wear. 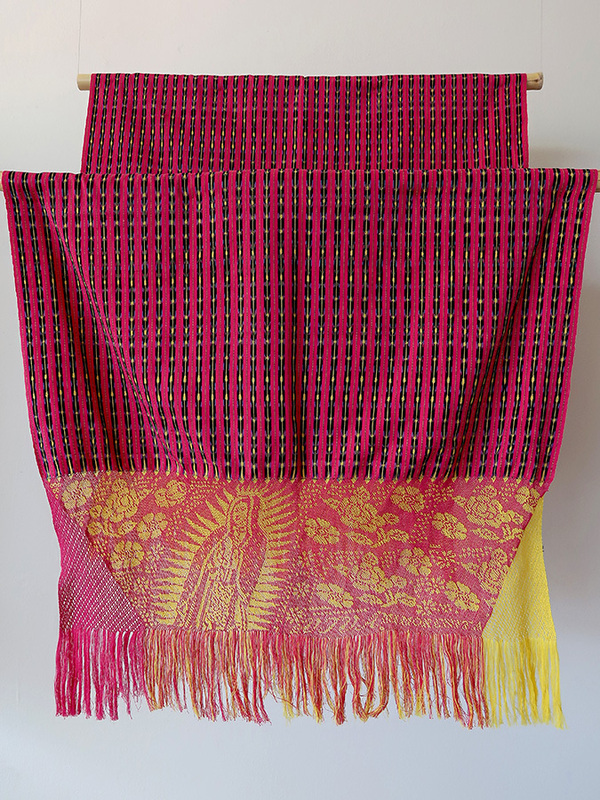 First, a modern asymmetric take on a traditional huipil — designed, dyed, and woven on a backstrap loom by Moisés Martínez Velasco from San Pedro Cajonos in the Villa Alta region of the Sierra Norte. 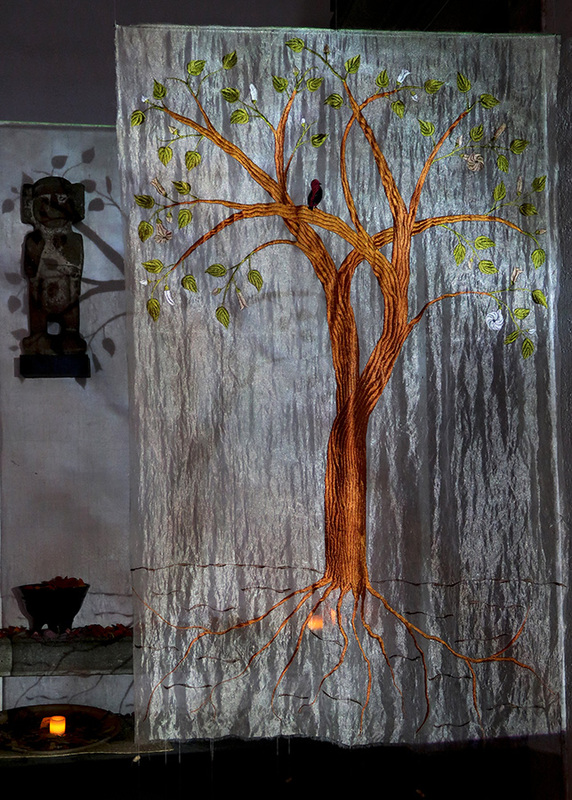 Villagers cultivate and harvest the silk worms and spin the silk used in making this beautiful piece. 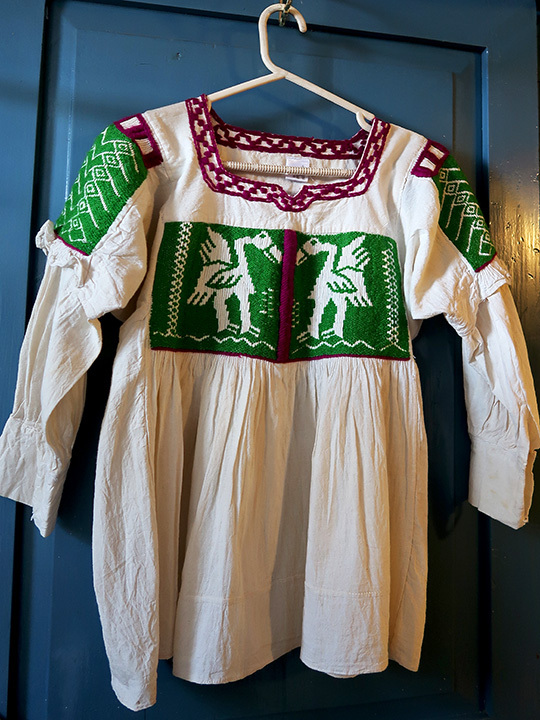 I also packed a recently purchased traditional blusa from the Mixtec village of San Pablo Tijaltepec. The blouses from this village are made from cotton manta and hand-embroidered with images of birds, animals, plants, and elements of nature in geometric patterns. The blouses take up to one and a half months to make. I wore it to the reunion picnic on Sunday and it received several compliments. 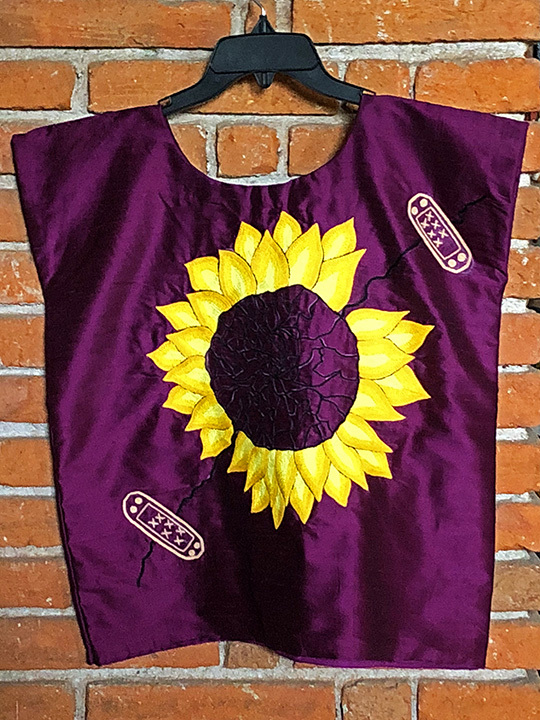 And, last but not least, I brought this elegant silk huipil with cotton chain-stitch hand embroidery designed by celebrated poet, Natalia Toledo. Honoring the traditional huipiles of her birthplace in Juchitán de Zaragoza in the Isthmus of Tehuantepec region of Oaxaca, yet bringing her own design esthetic to her label Teka, this woman of many talents works with seamstresses and embroiderers from the Isthmus and Central Valleys of Oaxaca to create one-of-a-kind pieces. I wore this to Saturday night’s reunion at the base of the Golden Gate Bridge beside the San Francisco Bay — and it was perfect! 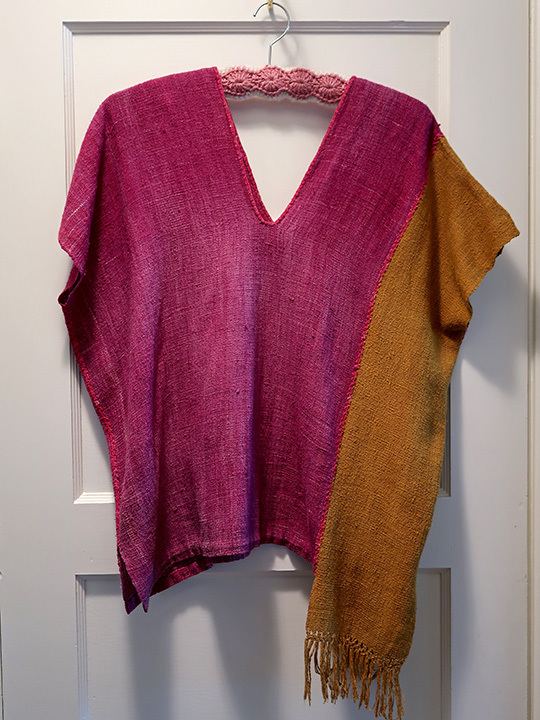 Besides the designs, colors (lately, I seem to be binging on burgundy), and handmade aspect of the work, I especially appreciate that I was able to meet and purchase each piece directly from its creator. 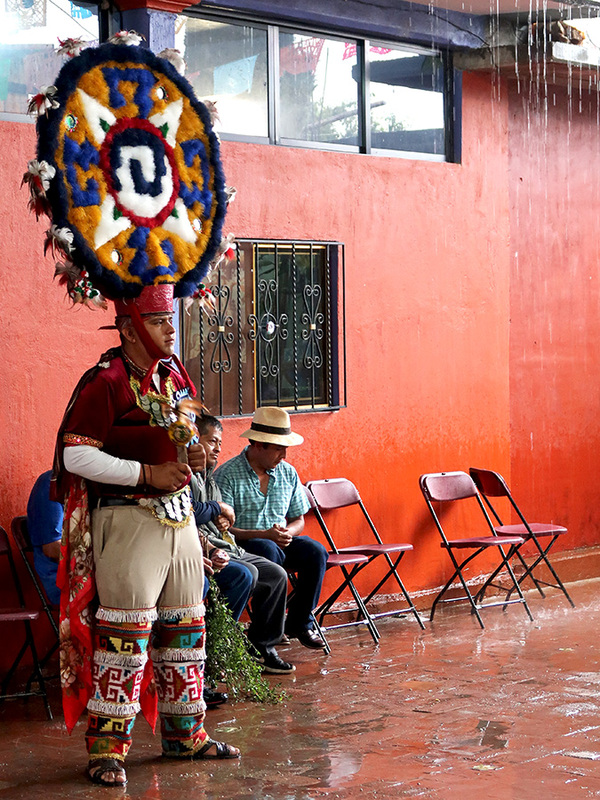 Saturday saw the inauguration of the long awaited Centro Cultural Comunitario de Teotitlán del Valle (CCCTV). 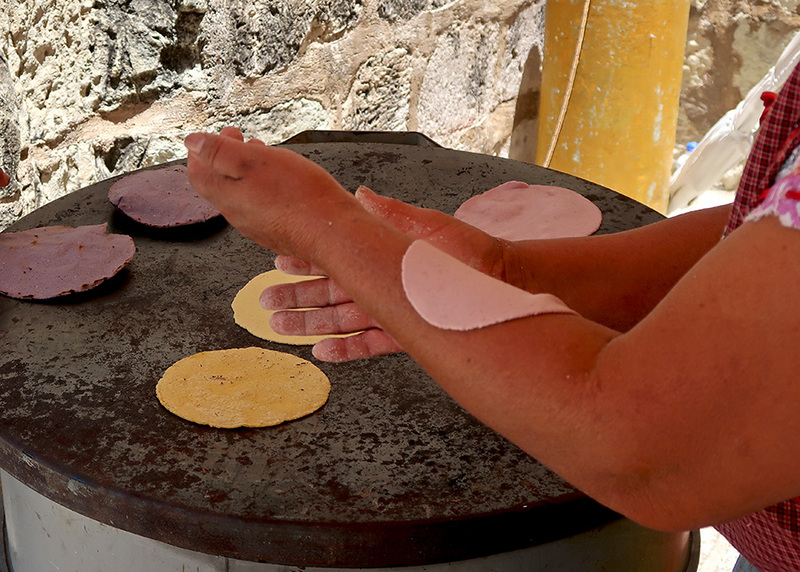 We, along with the citizens of this Zapotec community, have been wondering and watching the progress of the building, located between the municipal building and tapete (rug) vendor stalls, for 3+ years. 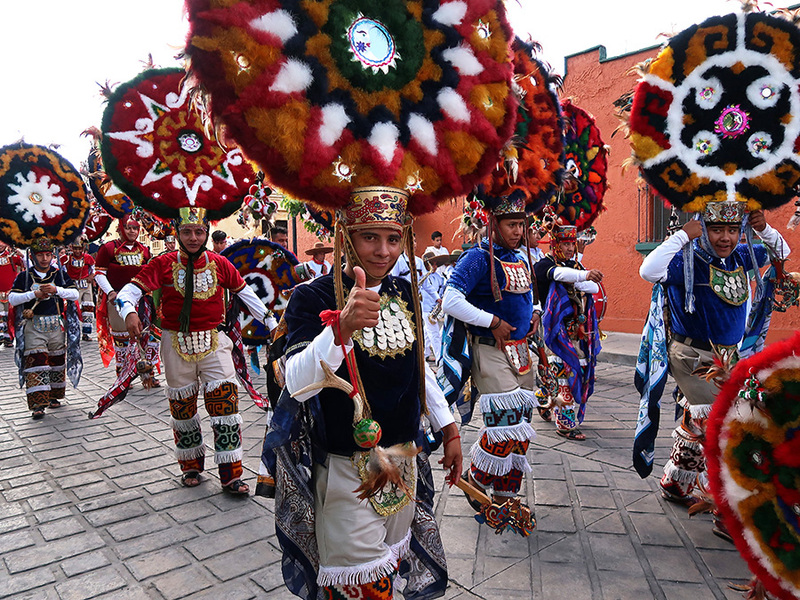 And neighboring municipality, Tlacolula de Matamoros, participating with one of their gigantic marmotas and dancers. 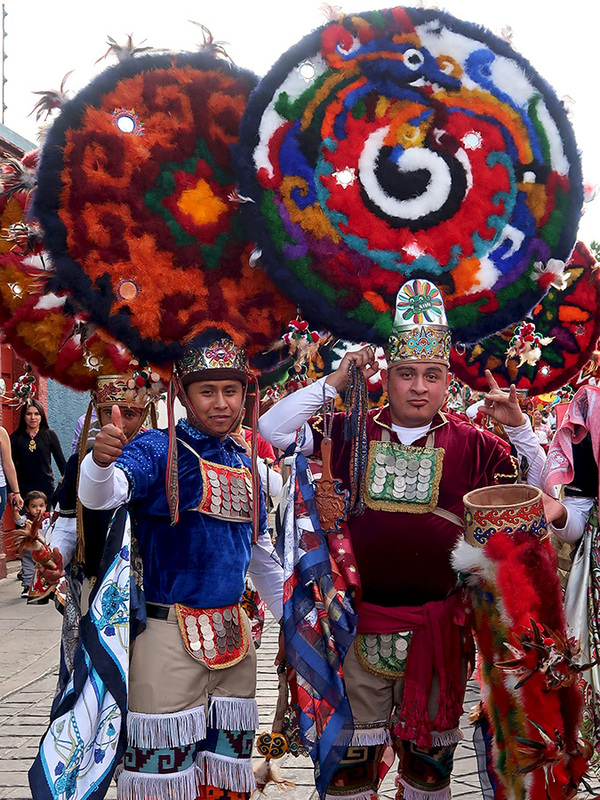 There were two bands supplying a marching rhythm and soundtrack — the first to lead the procession and, at the tail, Los Reformistas, accompanying the Danza de la Pluma Promesa 2016-2018. 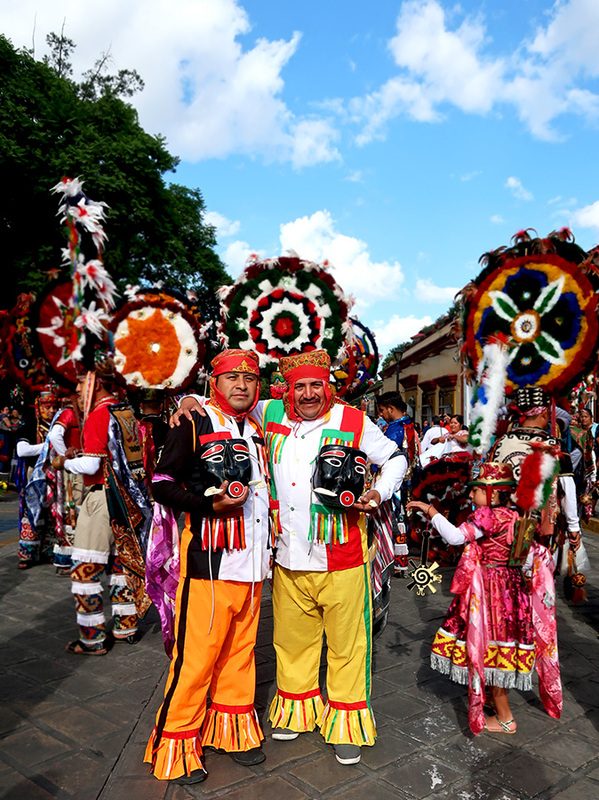 The danzantes danced their way onto the plaza and performed. 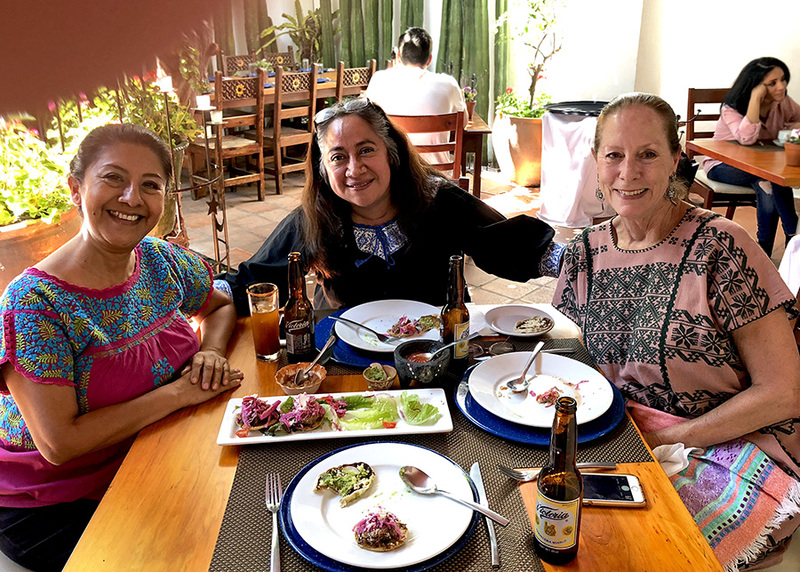 Then villagers and visitors settled down for words of welcome by community leaders and the new cultural center director Abigail Mendoza (yes, the world famous cocinera), food and drink prepared by the women of Teotitlán, and a moving song by Lila Downs, a madrina of the inauguration. By the way, several times during the event, Teotitecos proudly informed me that besides the CCCTV’s newly elected director, all the members of the cultural center’s governing committee are women. Centro Cultural Comunitario director Abigail Mendoza (far left) and her committee. There were musical performances and then a ribbon cutting to formally open the CCCTV — a building that was awarded the 2017 Cemex first place in the category of Collective Space, Gold Medal in the 3rd edition of the Architecture Biennial of Mexico City 2017, and the Silver Medal in the 15th edition of the National and International Biennial of Mexican Architecture 2018 (Centro Cultural de Teotitlán del Valle, Oaxaca). 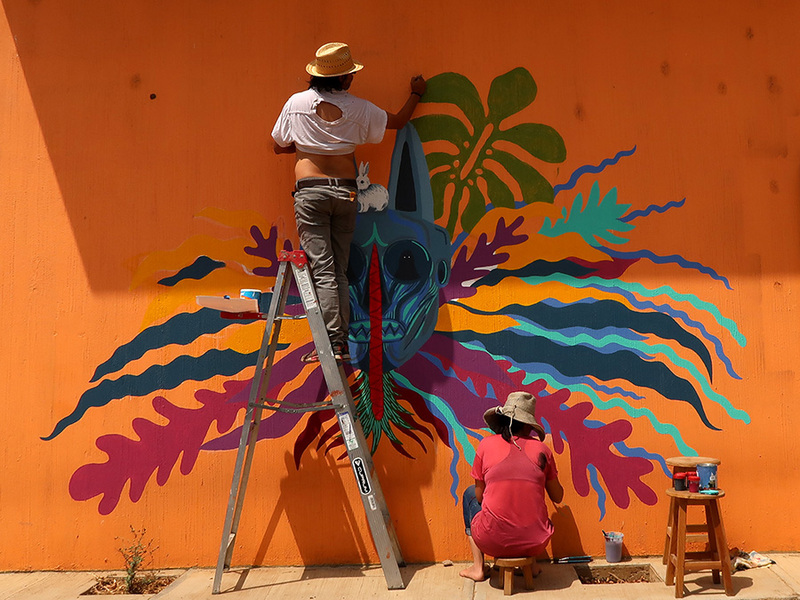 At long last, the Centro Cultural Comunitario de Teotitlán del Valle was open to the public — and they poured in to view the spaces, exhibits, and Pablo Picasso community library. However, that was far from the end of the celebration! 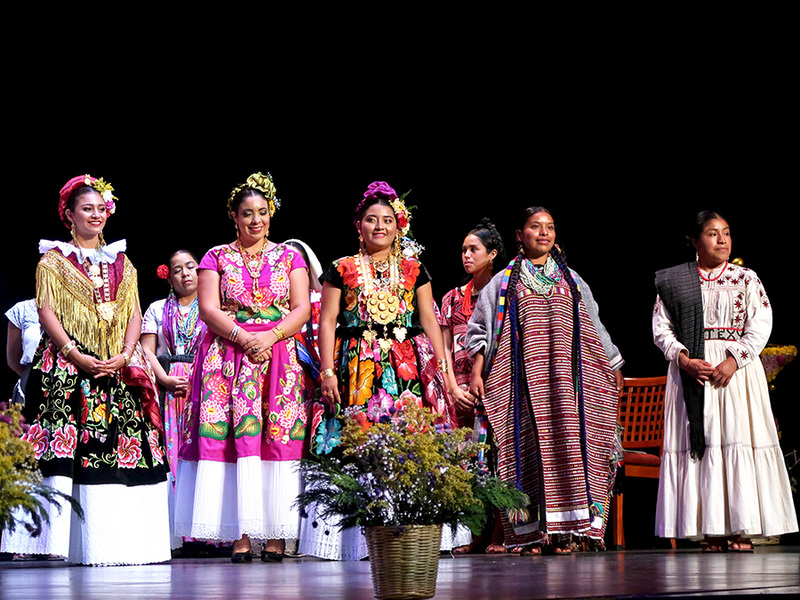 A mini Guelaguetza began with the (above mentioned) delegation from Tlacolula, followed by the folkloric group, Grupo Dancistico Ritmo de Mi Raza, showcasing dances from the eight regions of the state of Oaxaca, and finished with an encore performance by Teotitlán’s Danza de la Pluma Promesa. 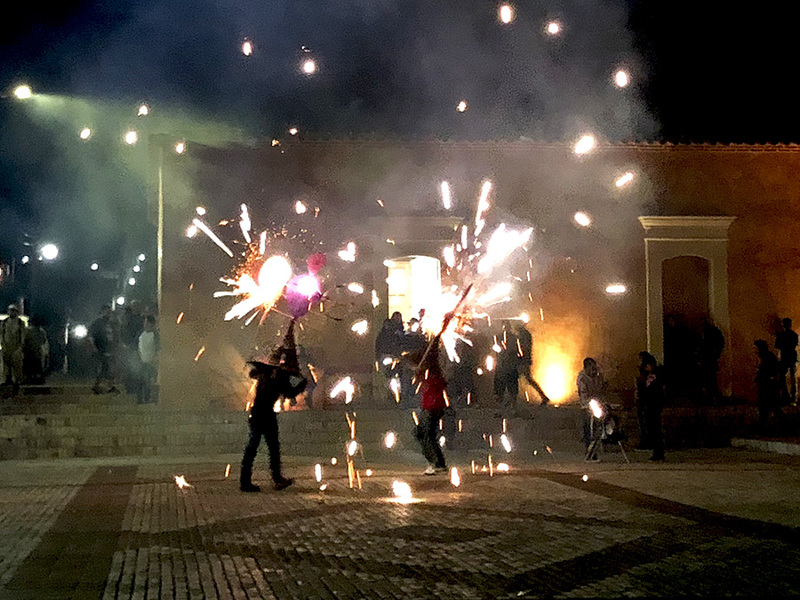 The celebration ended 10+ hours after it began, with the abuelas (seen above), village leaders, and the Cultural Center Committee dancing the jarabe in front of the municipal building, accompanied by the exploding sights and sounds of toritos dancing in the plaza, a few steps below. 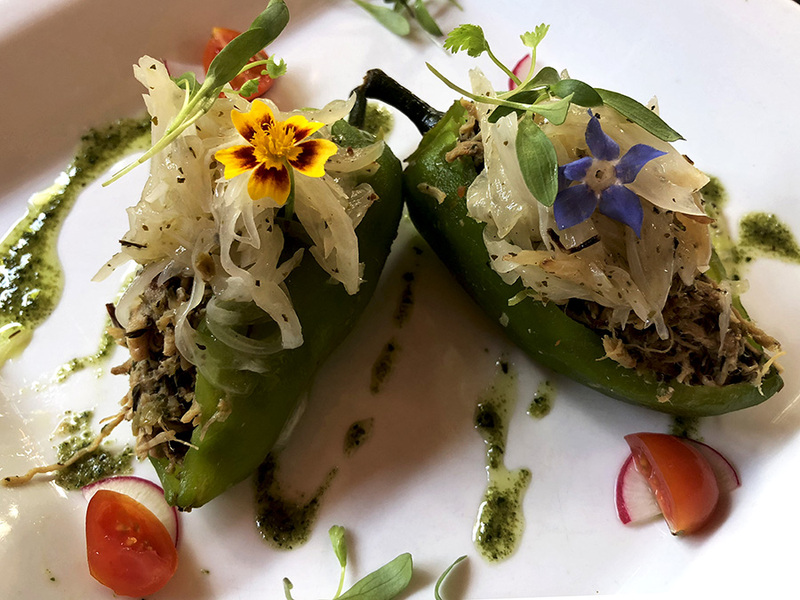 In addition to permanent exhibits and library, the CCCTV also includes gardens, a store, meeting spaces, and will host temporary exhibitions, along with ongoing cultural and educational activities for children, youth, and adults. 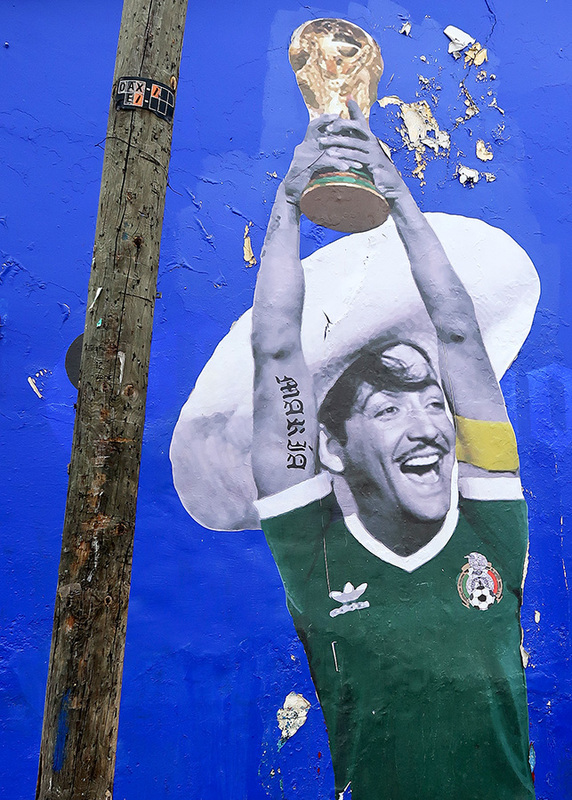 On the wall outside the Salon de la Fama cantina (corner of M. Bravo and Porfirio Diaz), artist Efedefroy captured the mashup dreams of Mexican football (soccer) fans. The beloved singer/actor Jorge Negrete, wearing the jersey of El Tri and hoisting the 2018 World Cup. Alas, despite the “María” tattoo (La Virgen? No, probably 3rd wife María Félix), it was not to be. 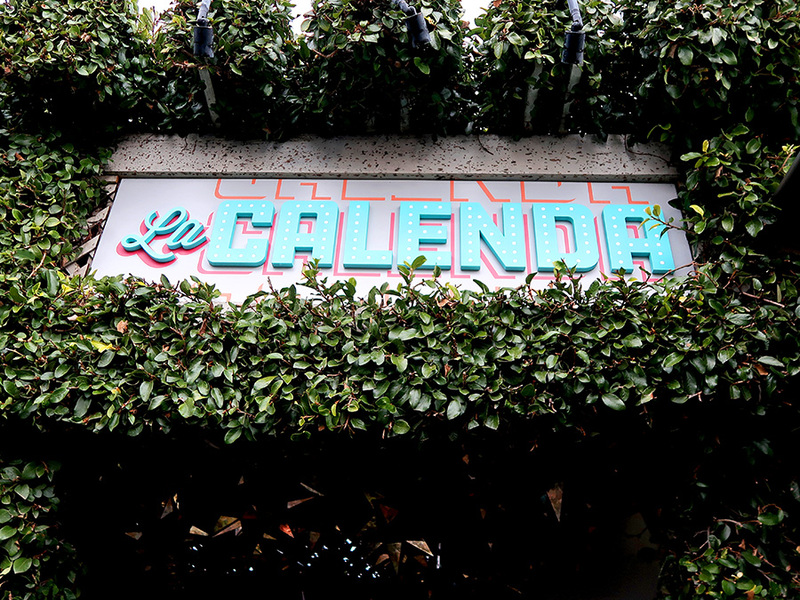 As I write, Diosa Centéotl 2018 is presiding over this year’s first Lunes del Cerro (Mondays on the Hill). 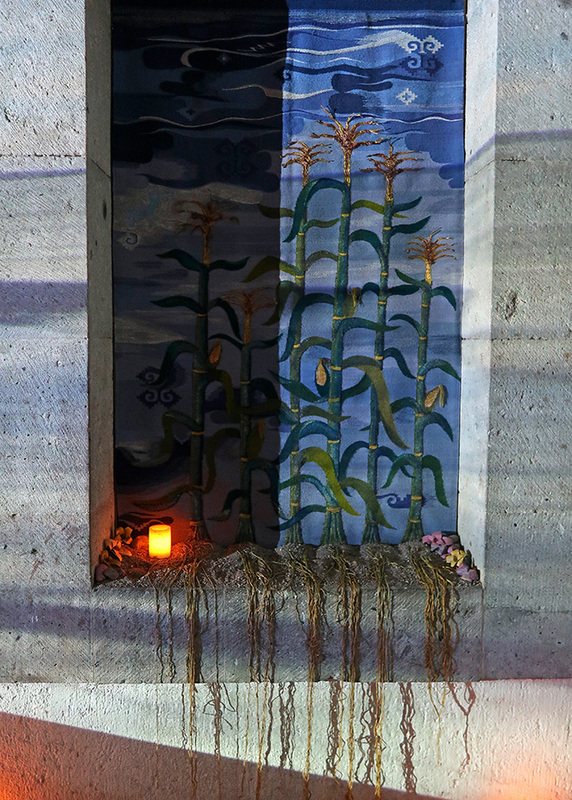 This is corn planting season and the figure of the goddess Centéotl represents the deity to whom rituals were offered to guarantee a good harvest. 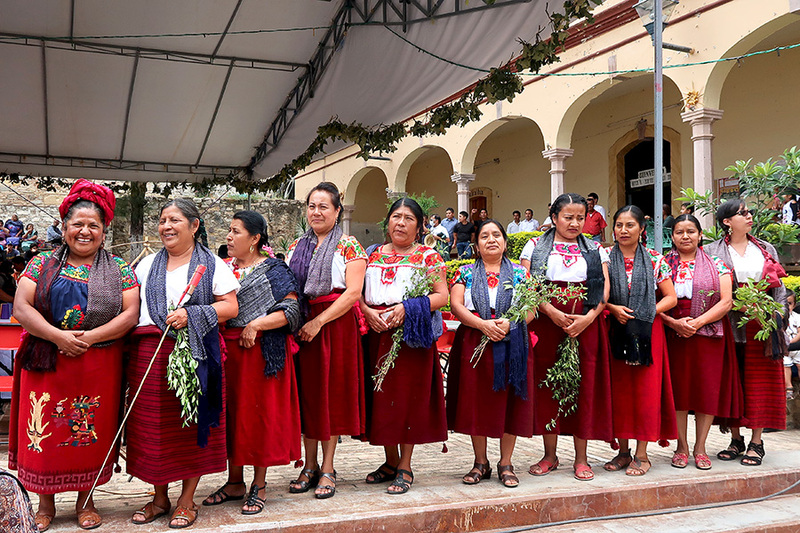 She was elected from among 27 young indigenous women, representing the eight regions of the state of Oaxaca. 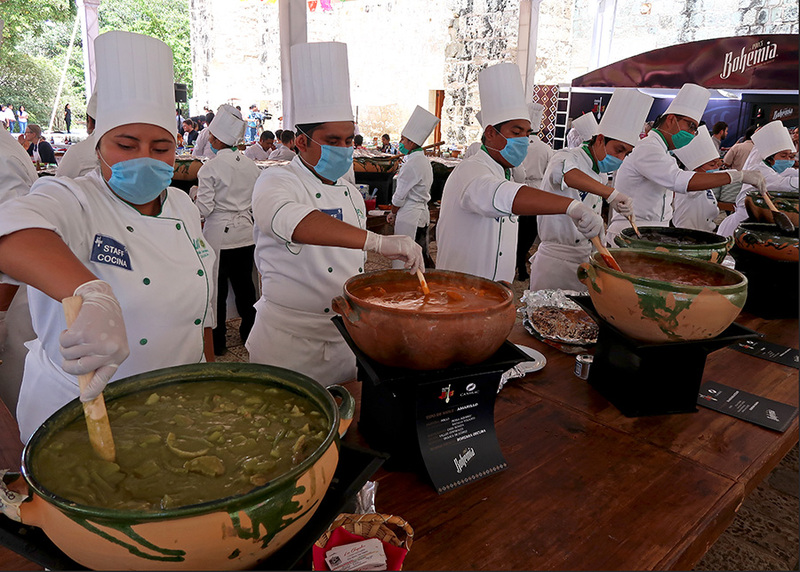 The first stage of the competition was held Friday morning at the Jardín del Pañuelito, with contestants speaking about their regions and communities. During stage two, later in the afternoon, the participants talked about their distinctive clothing. 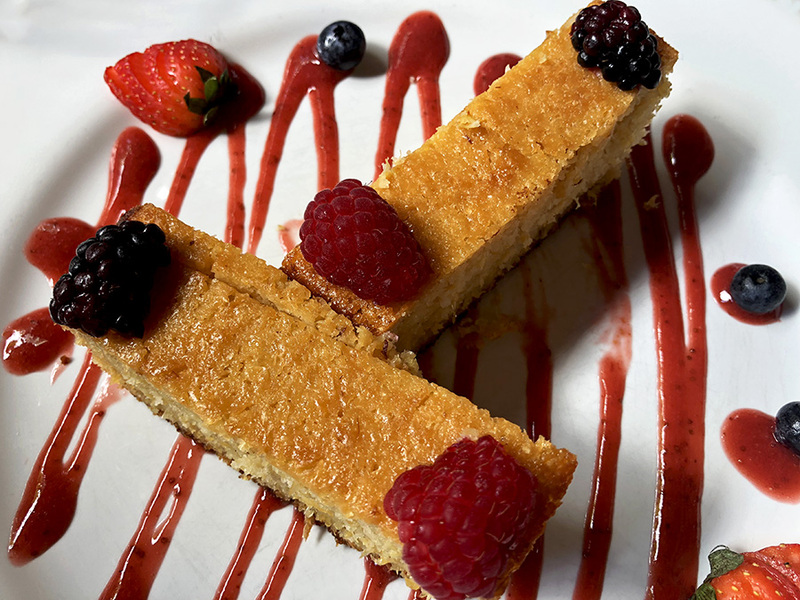 (For a few photos, check out Of Goddesses and Food.) 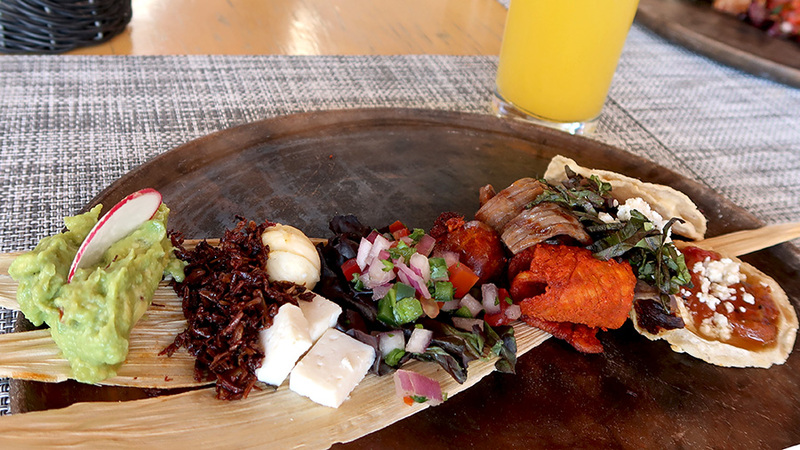 The judges, including Las Quince Letras cocinera and ambassador of traditional Oaxaca cooking, Celia Florian (2nd from right), then deliberated. 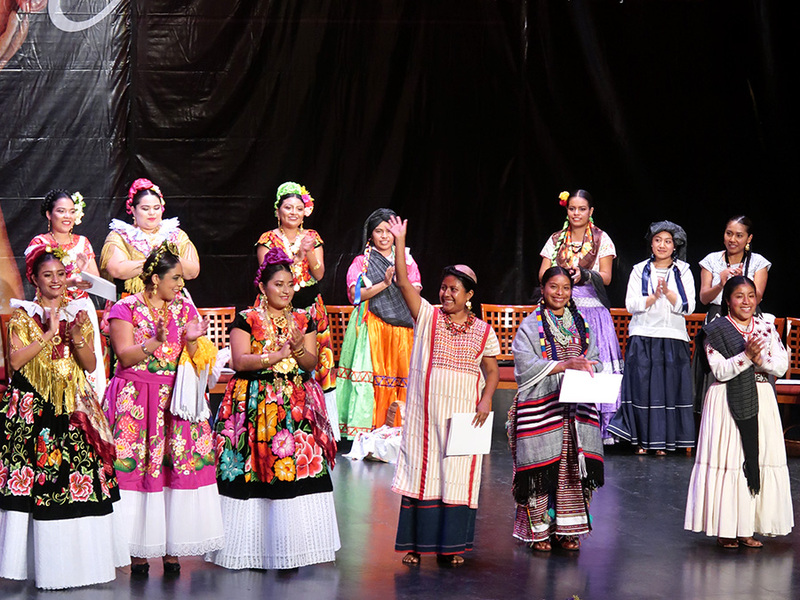 Saturday morning the venue moved to the elegant early 20th century Macedonio Alcalá theater where at least 500 people listened as the “Court” of the Diosa Centéotl was announced: Hillary Naxhiely López (San Blas Atempa), Adriana Ramón Guzmán (de Asunción Ixtaltepec), Yoali Josabet López Quiroz (Santo Domingo Tehuantepec), Socorro Hernández Santiago (Putla Villa de Guerrero), and María del Carmen Vásquez Díaz (Santa María Tlahuitoltepec). 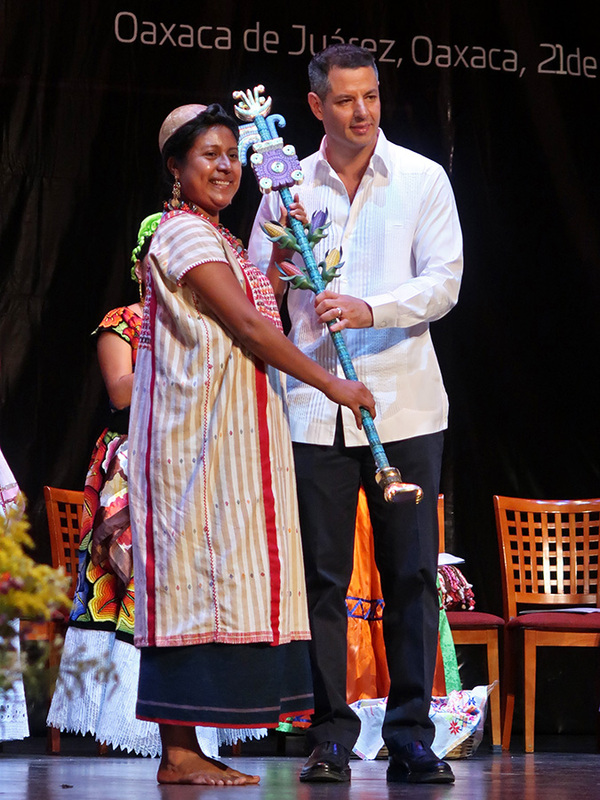 A beautiful scepter, carved and painted by Jacobo and María Ángeles from San Martín Tilcajete, waited in the wings to be presented to the new Diosa Centéotl. 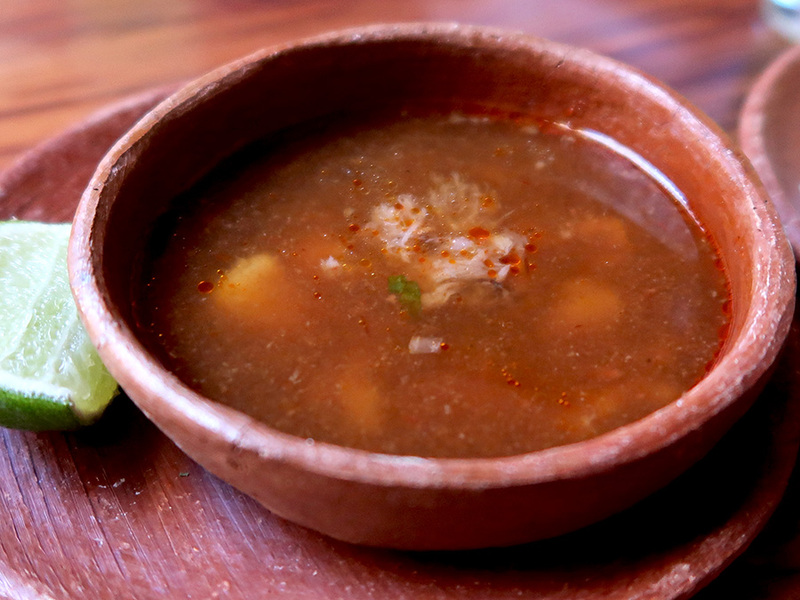 And, the winner was… Francisca Pérez Bautista from Santa María Zacatepec. 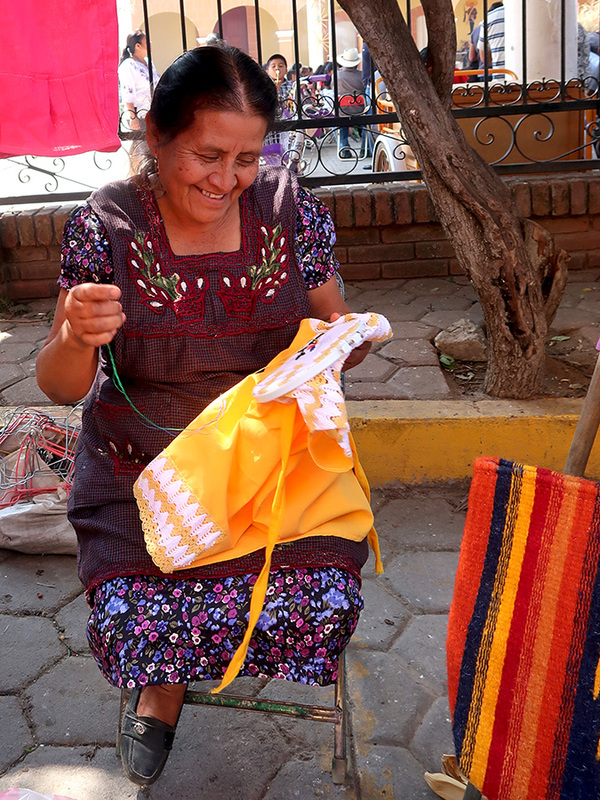 A member of the Tacuate ethnic group in the Sierra Sur region of Oaxaca, she was wearing the traditional cream-colored huipil with red ribbons and embroidery. 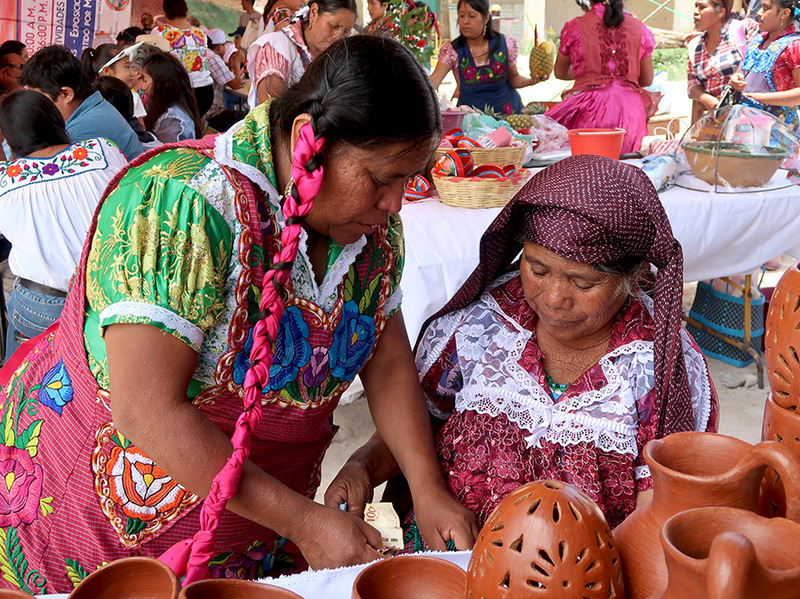 On her head, she wore the customary bowl-shaped jícara head covering made from the fruit of the calabaza tree. There was a twenty-minute break in the action — the governor, Alejandro Murat, was delayed in traffic. 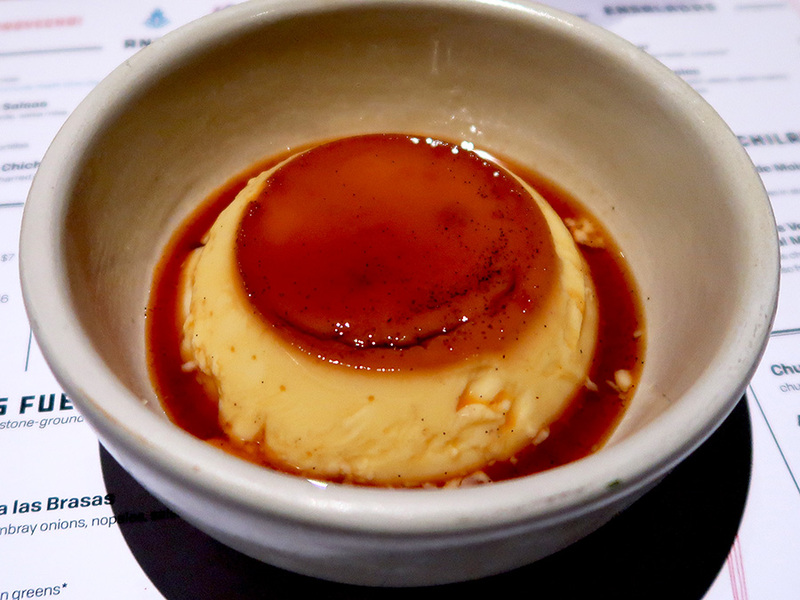 In the interim there was much affection and camaraderie displayed among the contestants. Eventually, he arrived and presented the scepter to Francisca. 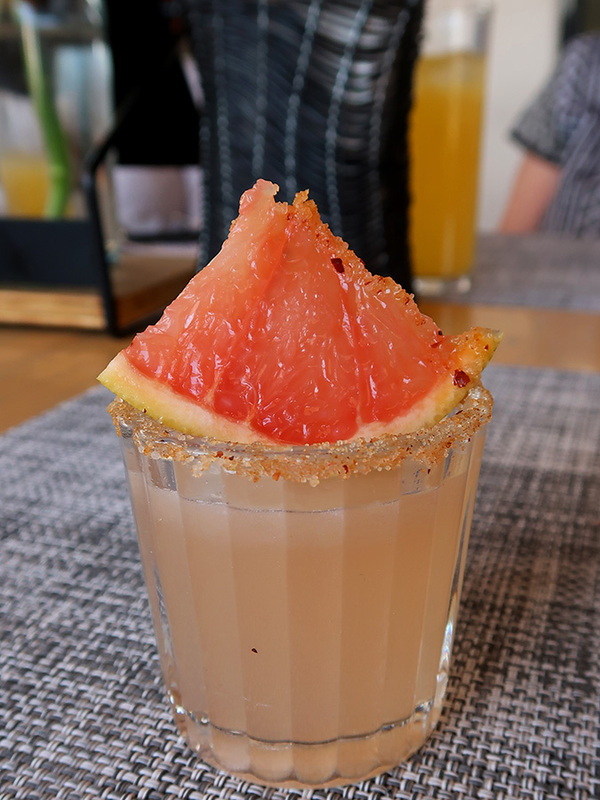 There was no rest for the new Diosa Centéotl. 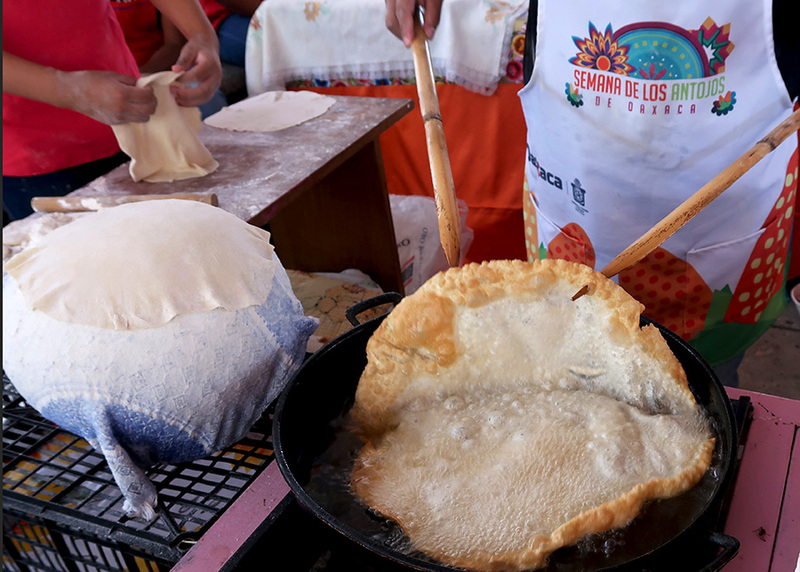 Her official duties began immediately — a luncheon with the Guelaguetza delegations, followed by leading the desfile of delegations through the city’s streets. 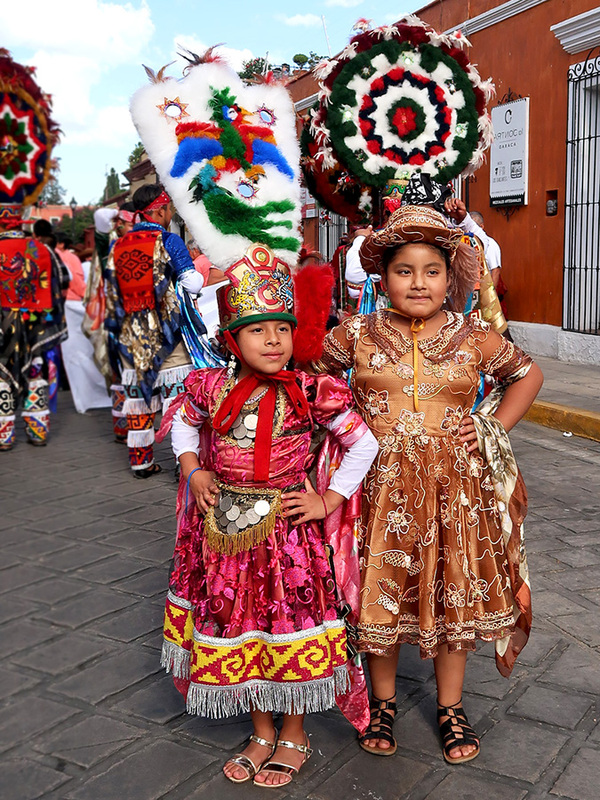 Teotitlán del Valle’s Danza de La Pluma Promesa 2016-2018 guys (and two little gals) came, saw, and conquered Oaxaca city yesterday. 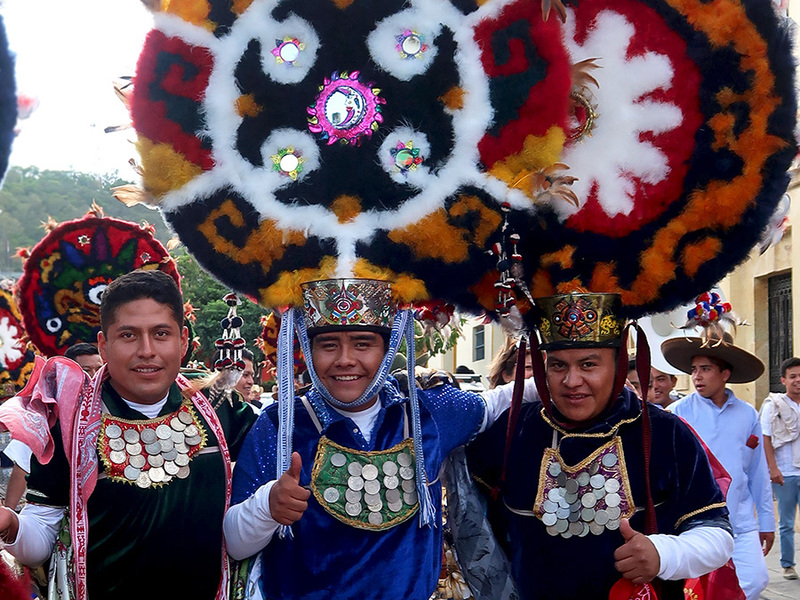 After a rehearsal at the Guelaguetza Auditorium, followed by a lively (if various Facebook videos are to be believed) luncheon with the other delegations, they arrived, raring to go, at the Guelaguetza desfile (parade) gathering point in front of Jardín Conzatti. 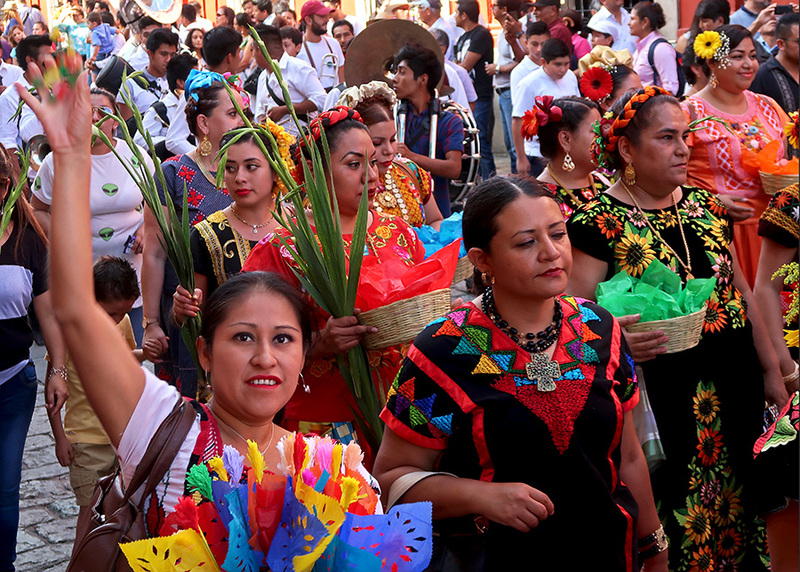 Along with the other Guelaguetza delegations, they posed for photos requested by the crush of media, tourists, and locals. And this year, unlike their last appearance two years ago, it didn’t rain on their parade. Following their banner and band, they danced their way through the streets of the city under a brilliant late afternoon sun. 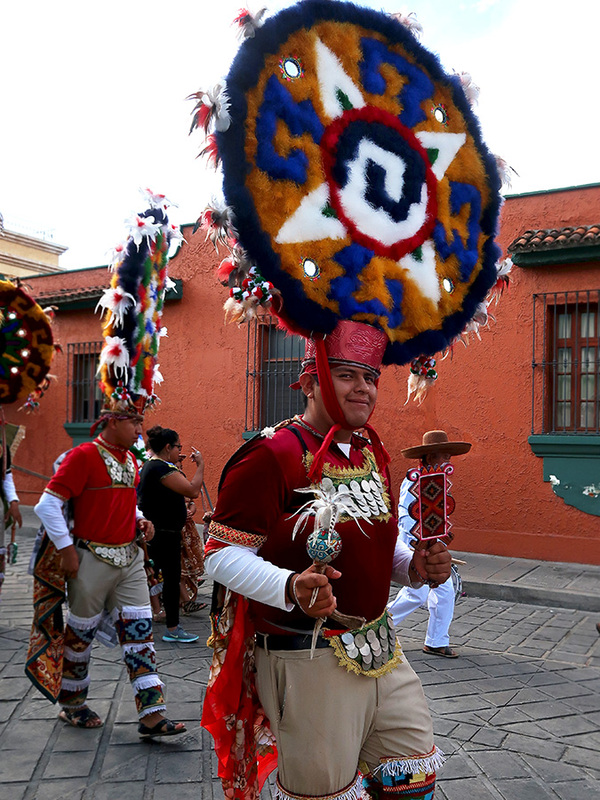 For more of the danzantes from Teotitlán del Valle at the desfile, check out the blog post from Chris. 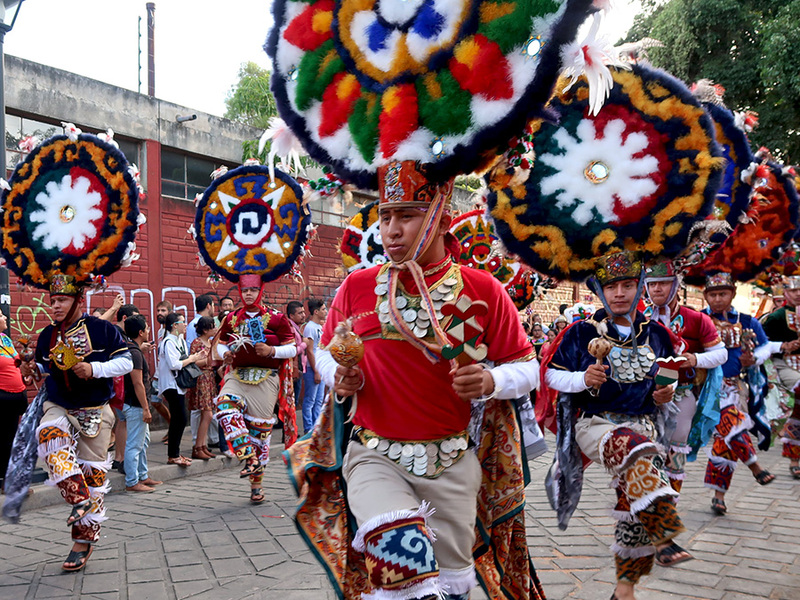 Next up, tomorrow morning’s performance up on Cerro Fortín! 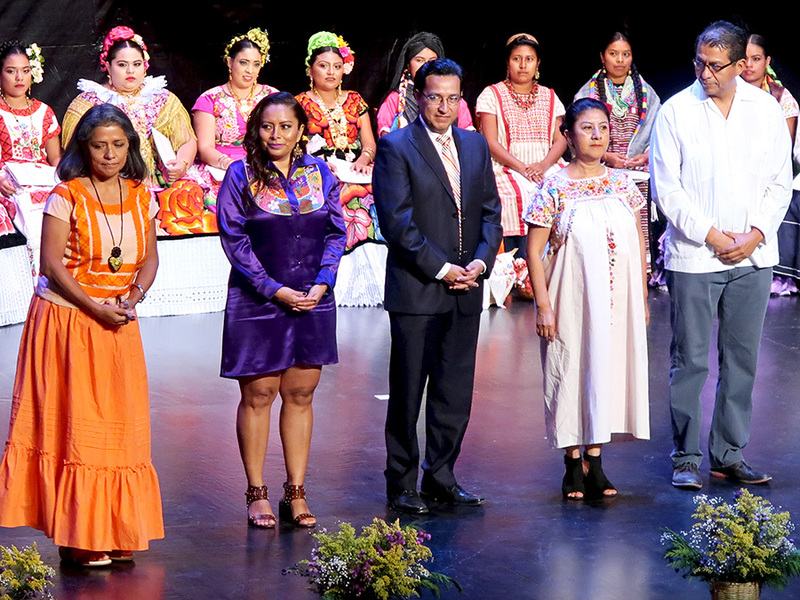 For those of you, like me, without tickets, check THIS SITE and/or CORTV for live (en vivo) links to each Guelaguetza performance. 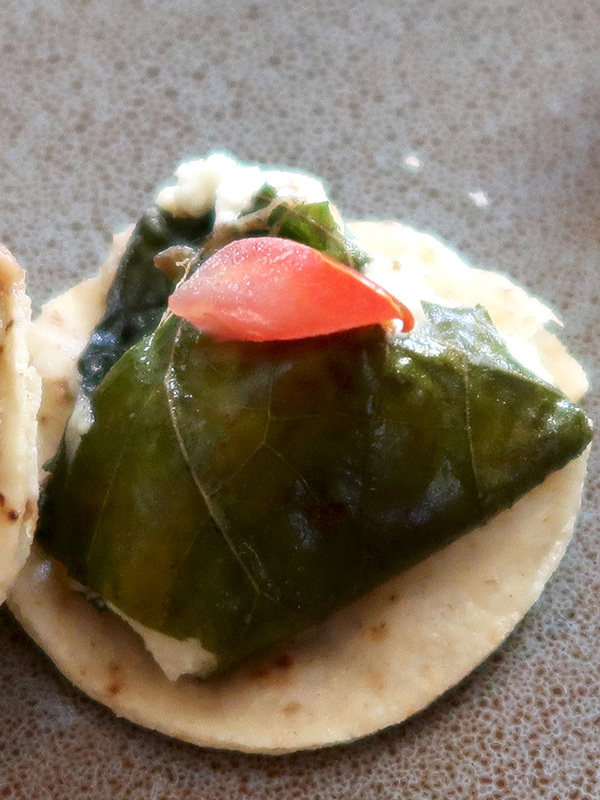 And you too can be a Tehuana in Oaxaca. 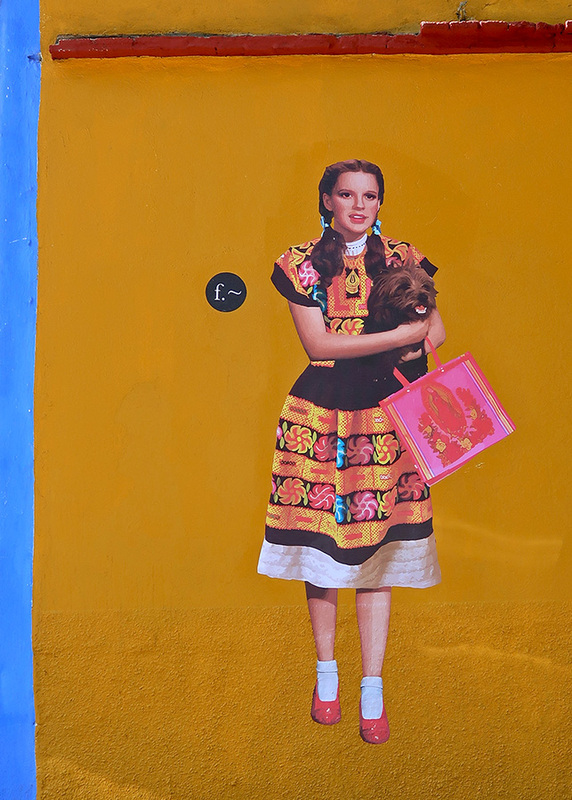 Seen on the wall outside Wearable Art Textile Studio, Gurrión 110 — across from the south side of Santo Domingo. Update: Artist is Froy Padilla Aragón (aka, Efedefroy). Check out an article (en español) about him HERE. 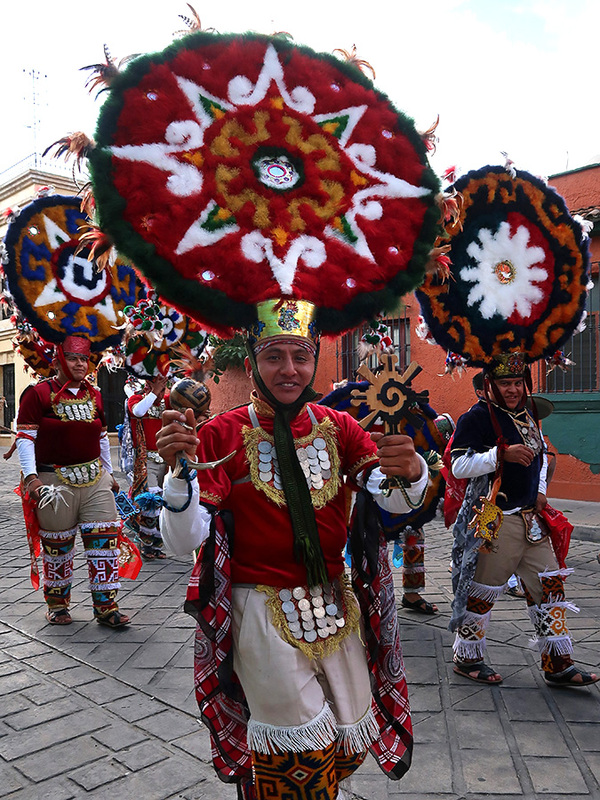 The Danza de la Pluma weapons of war consist of a small paddle (pala/macana) held in the left hand and a sonaja (rattle) held in the right (see images of danzantes in July 9 post). 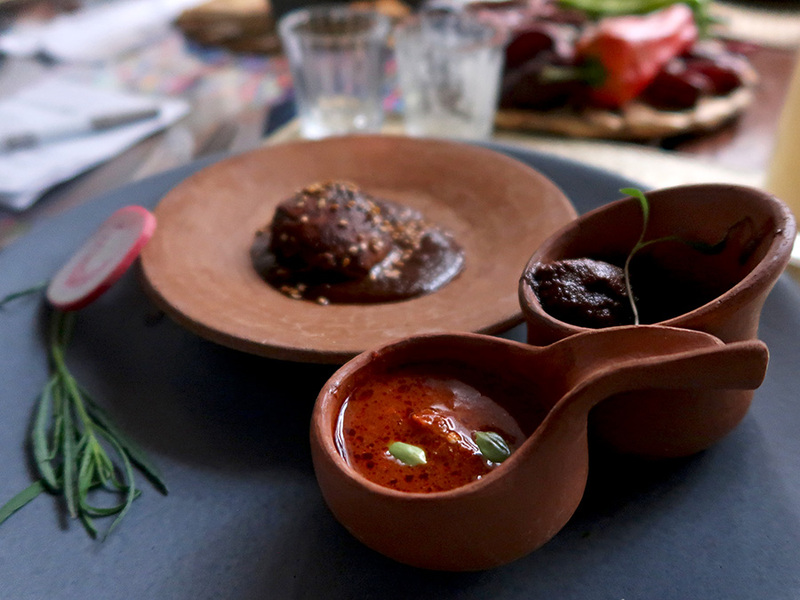 The sonajas are decorated gourds attached to a deer leg or antler. 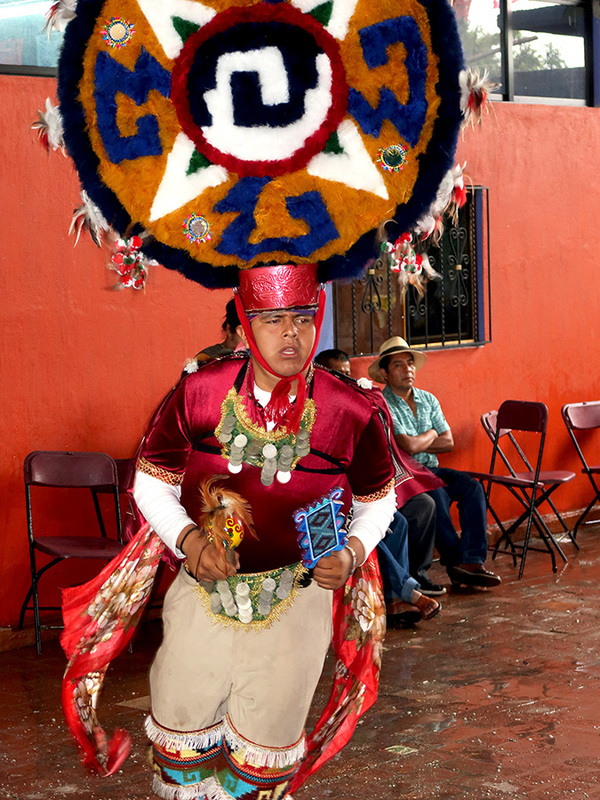 During the dance, they mark the compass points and their sound is used to scare the opponents. 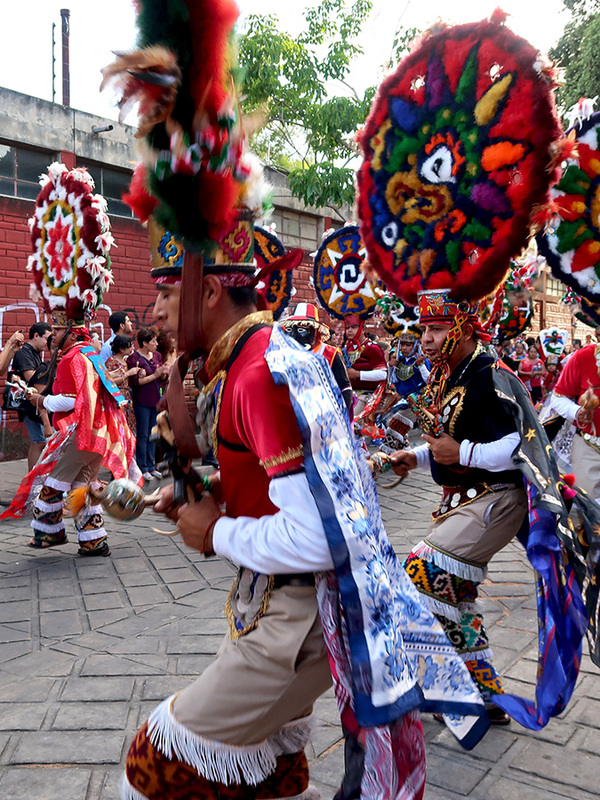 Each wooden pala is uniquely carved and decorated and serves as a baton and a shield in this dance that recreates the battles between the Spanish conquistadors and Moctezuma, his warriors, and allied kings. 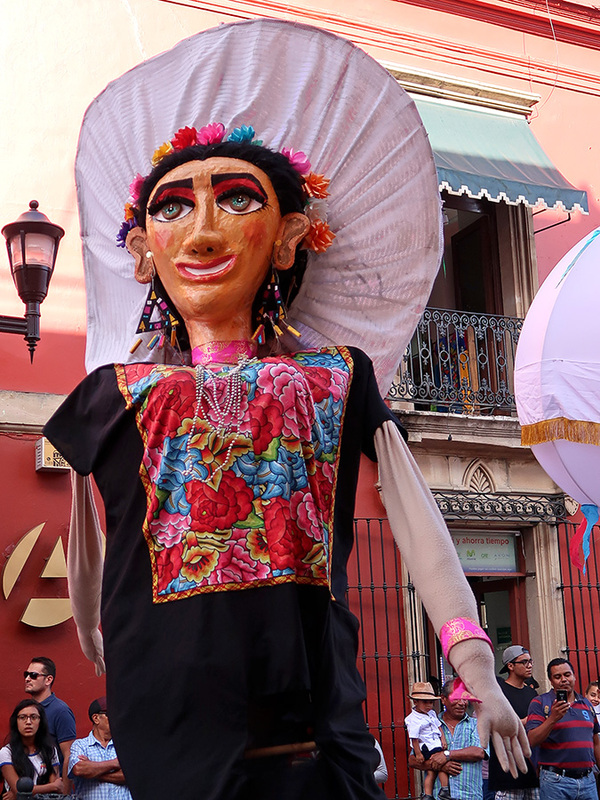 Even Malinche (Quetzalli del Rayo Santiago Ruiz) carries a sonaja and a pala during parts of the dance. 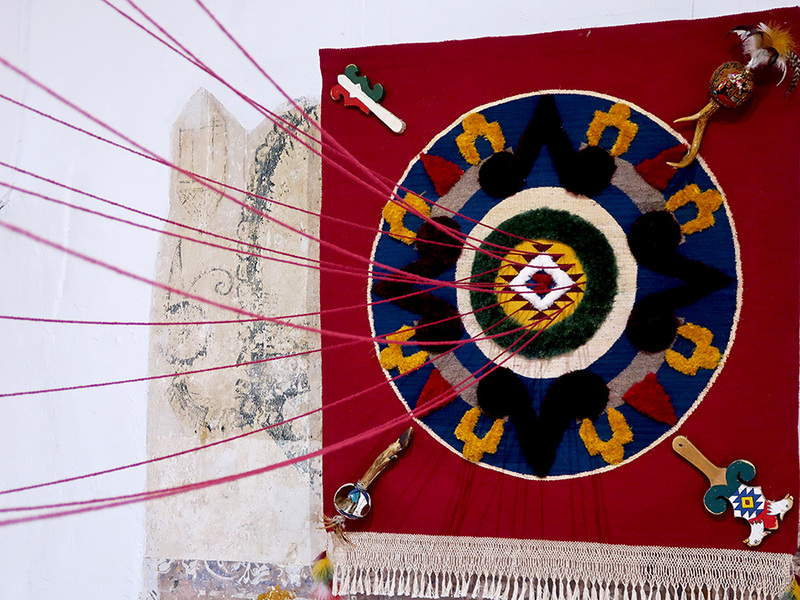 And, check out the reversible pala of Juan Pablo González Gutiérrez — red weaving surrounded by alebrije-like painting on one side and blue weaving and painting on the other. You can click on images to enlarge them. 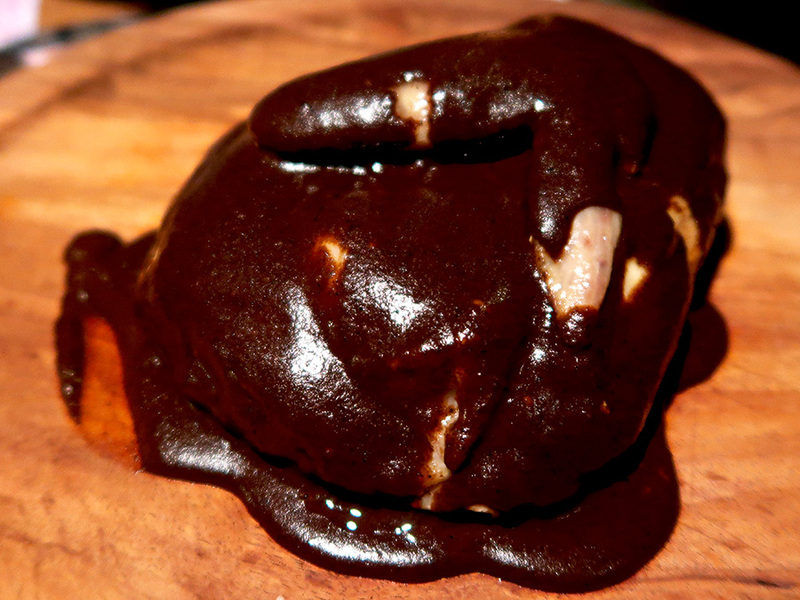 The creativity never ceases to amaze!